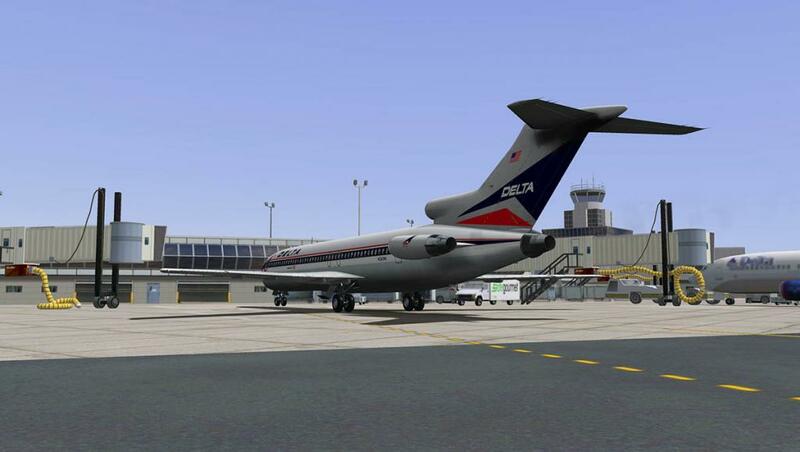 Aircraft Profile : Boeing 727 Series by FlyJSim (Part Two) "Flying the Boeing 727"
The FlyJSim Boeing 727 Series is a way of time traveling to another era. In this case the 1960's. Here is an aircraft that transcends time like no other in the feel and the flying environment of one of the "Golden" periods of flight. The Boeing 727 was in many ways a very unique aircraft and very popular with operators and passengers alike. 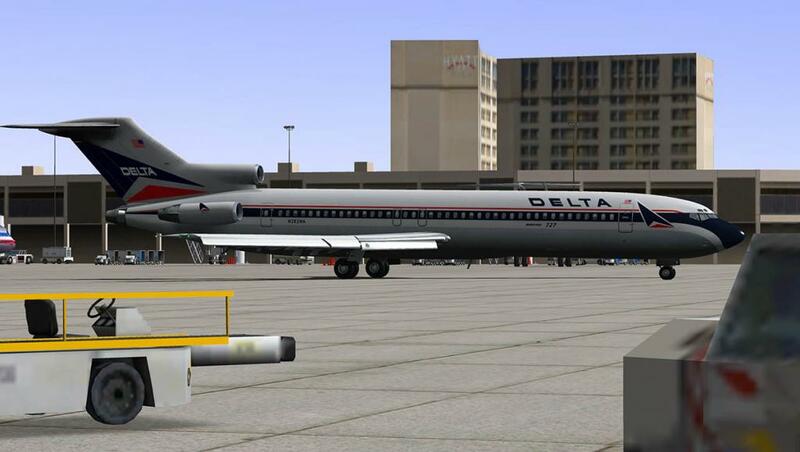 The 727 was a creation of its time in that many airports were really very basic in the 1960's compared to even the smallest commuter airports of today. 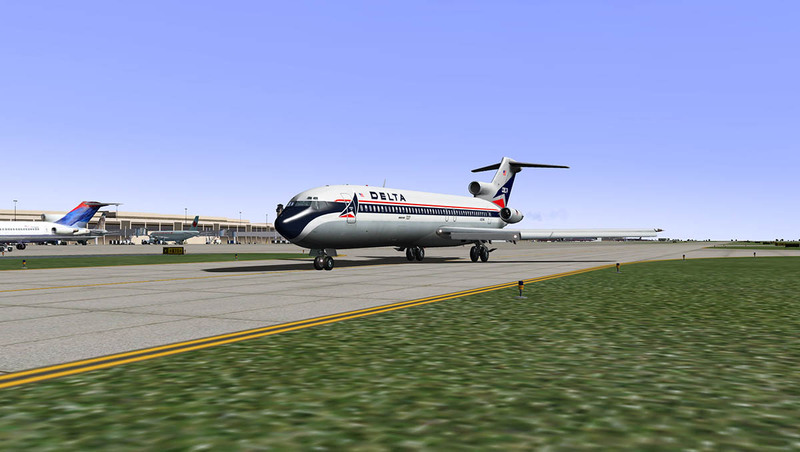 And the B727 was very able to land on short runways (around 4800-ft (1463m)), but to also unload/load passengers and even power itself while sitting on the ground. The aircraft brought a Jet service to even the smallest and remotest communities. It was also had an excellent range for short- to medium-range international flights and the safety of three engines over water. So what was airline flying like back then. 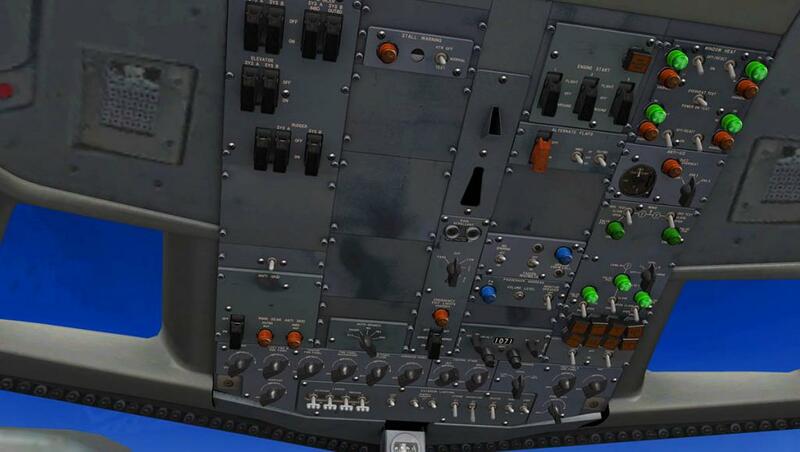 How different was the way you operated the Boeing 727 compared to today's computer based systems and workflow cockpits. 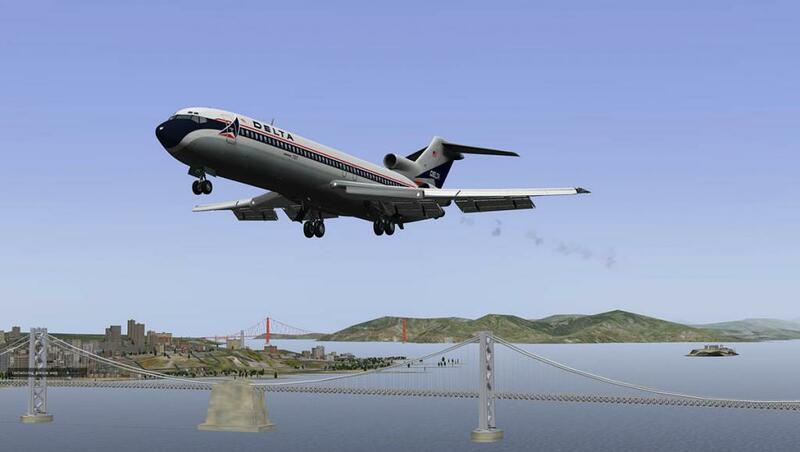 To do that we will fly the aircraft in this case the 727-200adv version from Dallas to San Francisco (Oakland), so buckle up and enjoy the ride. On any question an aircraft is an aircraft in the way it is basically laid out and flown. From a General Aviation trainer to the Airbus A380 you can easily see the the same controls and instruments and the way you fly them is in generally all in the same way. What has changed today is the way you interact with the machine. Today digital rules, as computers now run the flight-deck from the management of the engines to the routing and navigation and even now to the controlling of the flight controls (fly-by-wire). So if you took all this away then what do you have, In our case a Boeing 727. 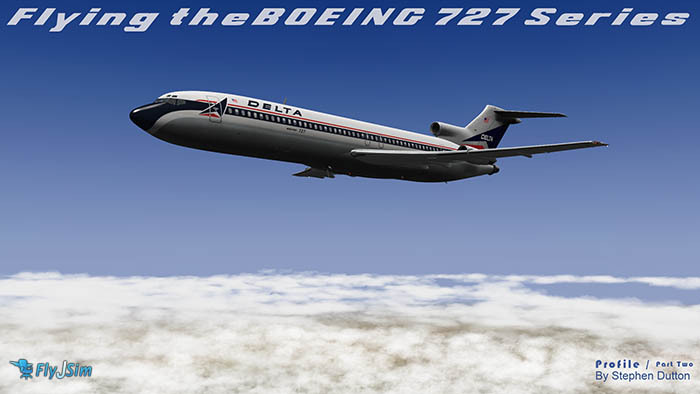 The integrated chip was still non-existent in the day the early B727's took to the air and yet these aircraft could and did function in the same capacity as the aircraft fly today, The main difference between them is cost-efficiency and reliability, and even then these Boeing aircraft were very reliable for their day. 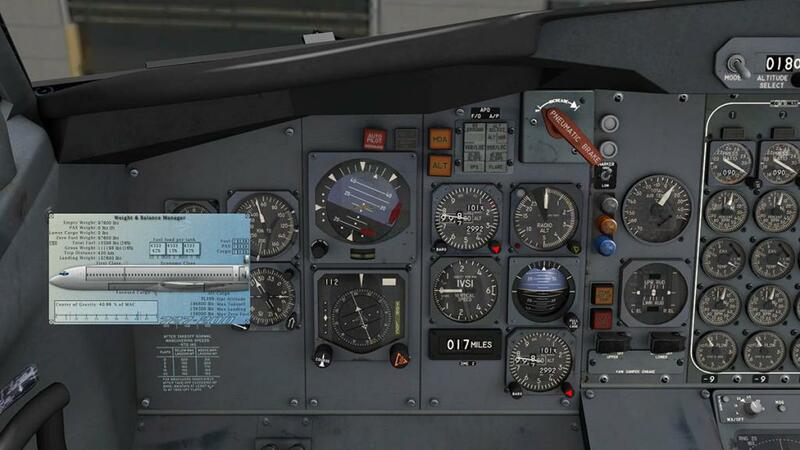 The 727 cockpit is very different in that it is all gauges and dials (known as a "Clockwork Cockpit), no glass screens or menu driven tabs are in here. 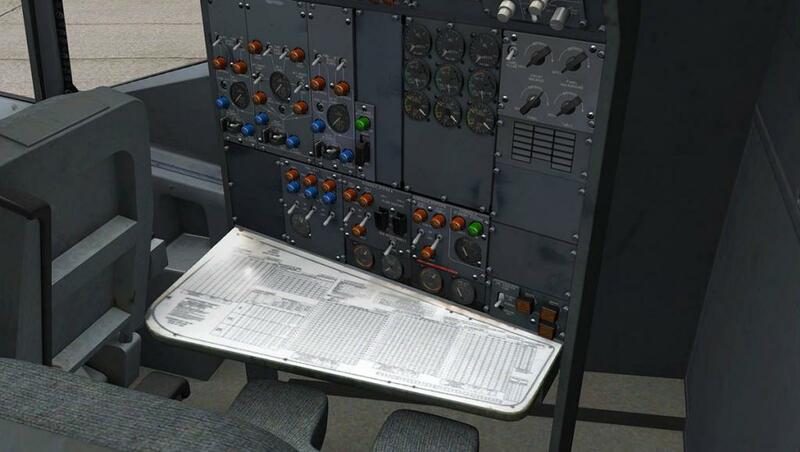 There is also a third person to help you handle out with the aircraft systems as well with the Flight Engineer (FE) who is situated sitting rotated 90º behind the Co-Pilot. His panel is bigger than the main panel and today most of his systems have been transferred to the Overhead Panel (OHP). The center of the panel is dominated by the sets of three engine dials covering "Pressure Ratio (RPM), N1, EXH (Exhaust) Temp, N2 (RPM) and Fuel flow to each engine". 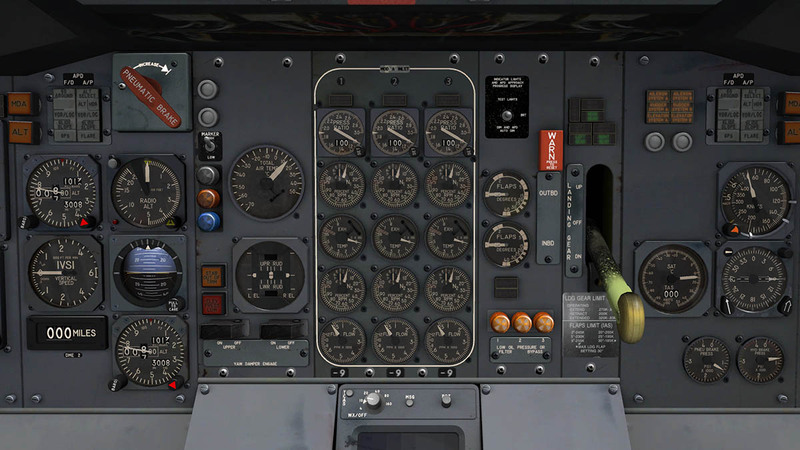 The detailing of these dials is breathtaking and simply eye-widening in operation and in fact the whole panel is exquisite in detail and design from FlyJSim. I doubt you will never get a better 60's cockpit like this. 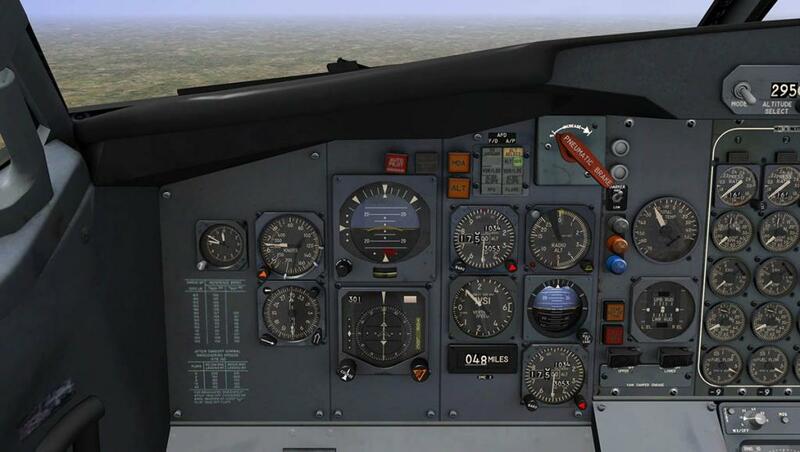 Step out of a General Aviation aircraft and into the B727 and you would feel more at home than a current line pilot would in the way you interact with the instruments. 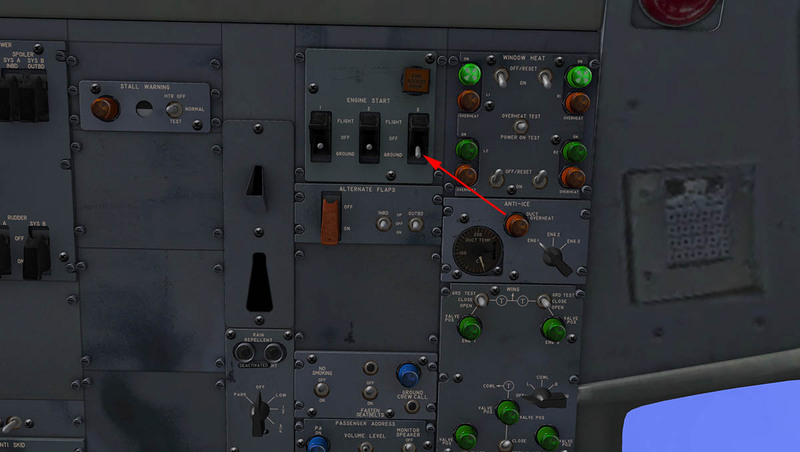 The three red fire handles are on the top of the glare shield and the "Radio" panel is situated behind the throttle pedestal. Each frequency is set and you just flip a switch over to activate the frequency that you require in all settings from COMM, VOR 1 and 2 and NDB (ADF or Automatic Direction Finder here). 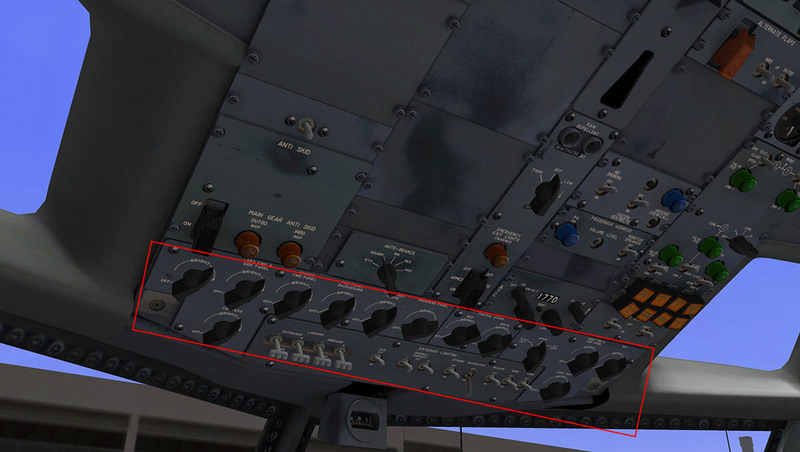 Below the radio is your large Rudder and Aileron "Trim" knobs and above the radio is the Autopilot (AP). For a large airliner it is quite rudimentary. 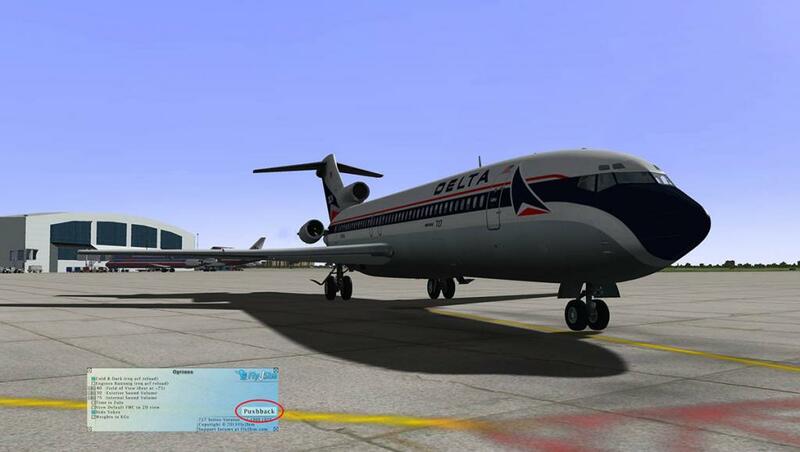 In fact your GA has probably a far more powerful AP than the Boeing 727. The AP may be rudimentary, but it is still highly effective in its simplicity. On the Overhead panel there is plenty of empty real estate, It dominated mostly by the (large swivel) lighting knobs and De-Icing switches (wing and engines), The pedestal is simply a beautiful sculpture to the age of mechanics. You can feel the levers and the metallic coldness in the design. In the three throttle (Built in reverse thrust) levers, Flap lever (right), Spoilers (left) and those huge trim (whirling) wheels with trim indicator. Lower down are also the three (one per engine) fuel flow/cutoff valves. All warning lighting (large) on the OH and FE panel works in the modern way in that all dark means everything is fine, lit lamps (usually red) means a problem, unless they are green which means the item is activated (De-Ice). 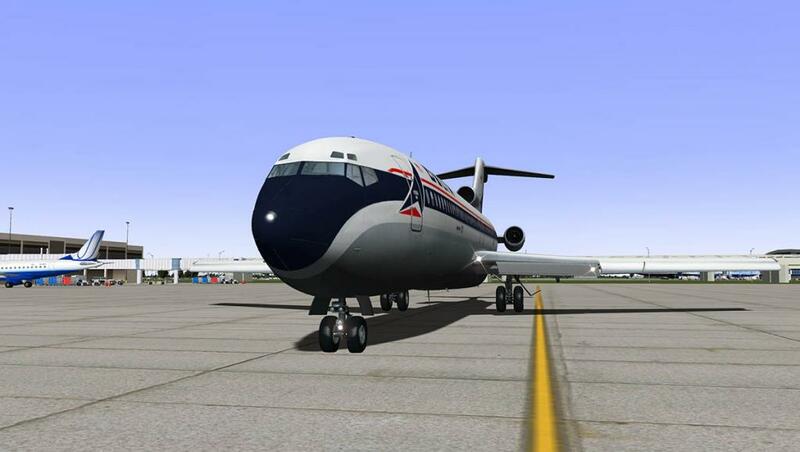 The checklist provided by FlyJSim is very comprehensive "SeriesChecklistandProceduresManual", You need to study it and understand all of the procedures correctly to get the best out of the B727. 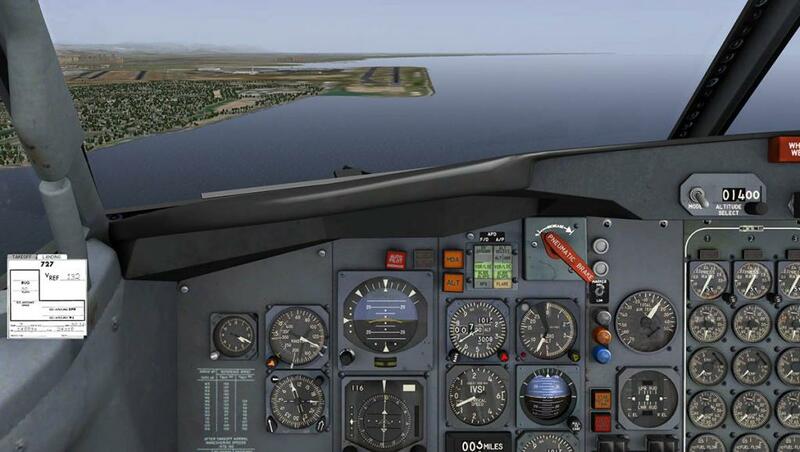 Another manual "SeriesSystemsManual" will show you were everything is located A third in "FJS-727 SeriesManouversManual" helps in the flying areas. A bit of study time early will provide a better experience later. Again to the untrained eye it all looks complicated, but it isn't if you you understand which block or set of panels does what. 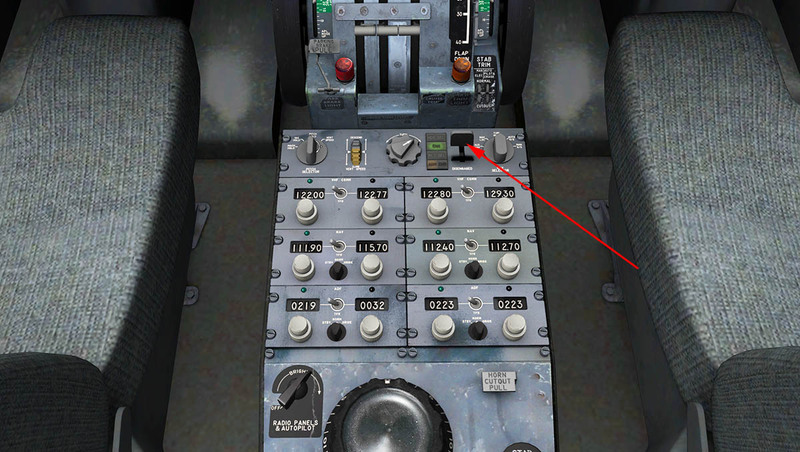 The main power (battery) switch is central high up on the FE station, If you have (AC) ground power then you can use that by selecting EXT PWR on the "Essential Power" dial switch, and switching the EXTERNAL power on (There is no power cart), However you will mostly use the APU engine (DC) and the APU panel which is situated on the back bulkhead. Flip the switch to start and wait while it warms up, Then select APU on the Essential Power dial switch and the two dials will show you the power supply. 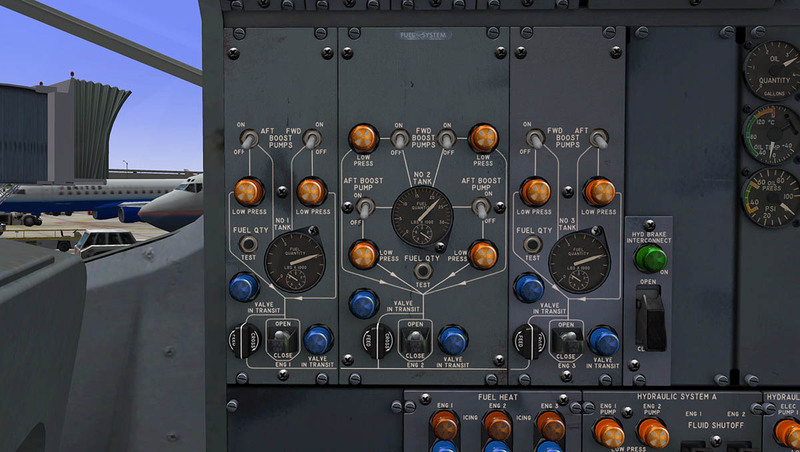 The B727 come with a great set of menus that are situated on the left of your screen. First open the "Weights and Balance Manager" (W&B.) 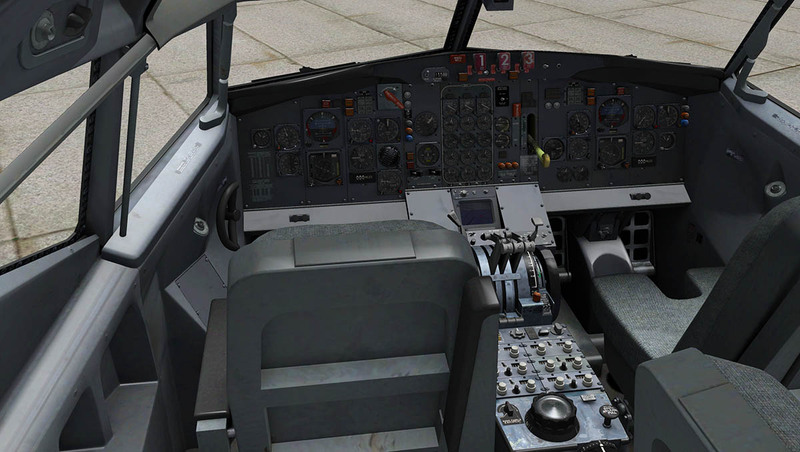 Here you can set your passenger and cargo payloads by selecting seats or containers, in doing so you can also see your Centre-of-Gravity (CoG) and the balance of the aircraft. Fuel loads can be selected here also and every change you make is reflected in the comprehensive weight (either Ibs or kg) references. 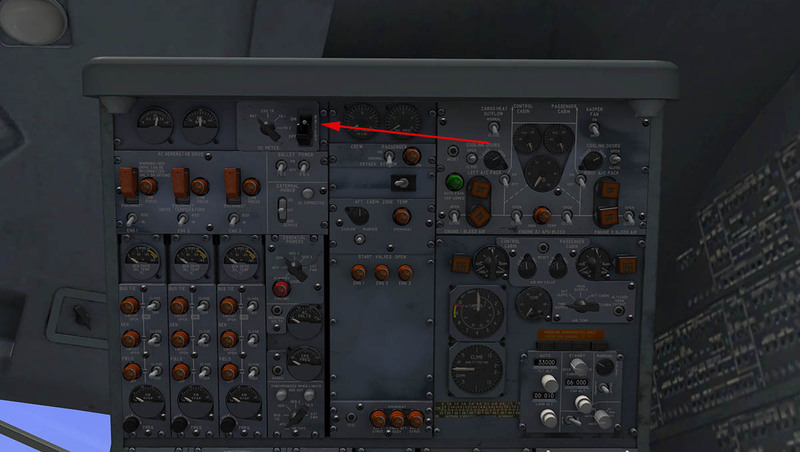 Better still open the "V card" and this menu will give you a full set of vRefs (flap settings as well) for the aircraft on Taking off or landing. No spending hours in going through tables here, just set your weights and then just note your vRef's... can't be easier than that. I'm going for a pretty heavily loaded economy class load, and so the aircraft is pretty heavy at 170,751Ibs. 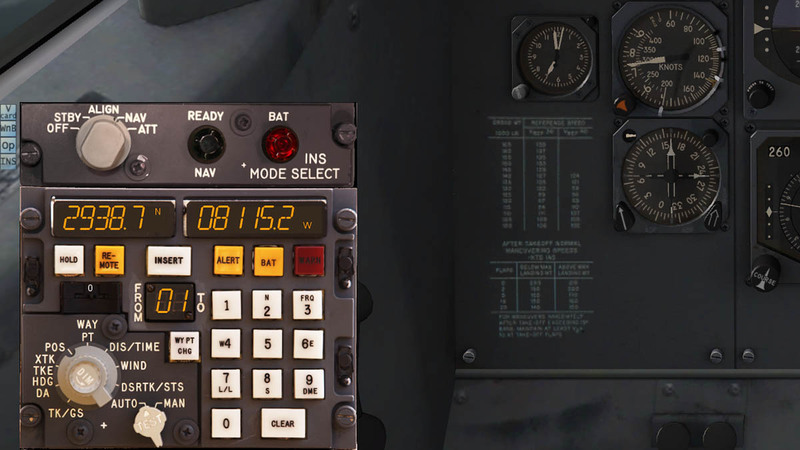 A final menu is for (O) Options in Cold and Dark start, Engines running, Field of View, Interior/exterior sound levels, Zulu time, Default view in 2d, Hide the Yokes and to set the Ibs or kg in the W&B manager. A look over at the fuel panel on the FE station and the fuel loads are now registered on the dials. As noted the checklist is quite comprehensive and there is a lot of items to check off and test. The passengers are boarded and we are ready to start the engines. Window Heat "on" (OHP) and Beacons "on". On the FE Panel right down low you turn on the hydraulics and then the boost fuel pump switches on the fuel panel. High right is the Air-Conditioning panel, but right right now we are concerned only with the "APU Bleed" switches (red arrows) to start the engines. So the Air-Con (A/C) packs must be off and the bleed switches open and the PSI will show on the dial. 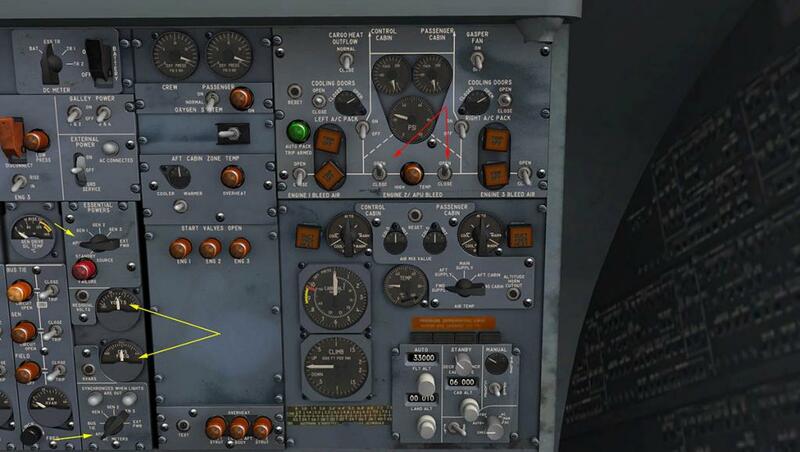 As noted you know the APU is pushing power to the aircraft by the (yellow arrows) dials (It will show the power output on the APU panel as well). 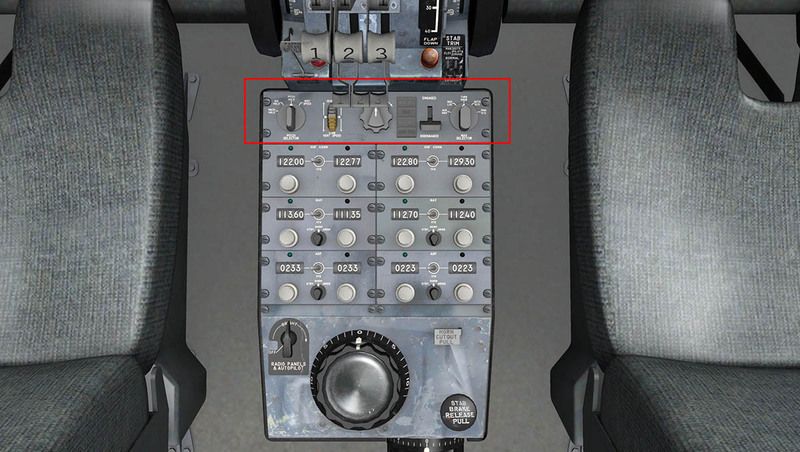 The three engine start switches are on the very top position on the OHP covered by black covers, flip each one open and the switch can go into two settings "Flight" and "Ground". Here we are starting on the ground so you would use "Ground" the other setting is for restarting the aircraft in the air (Flight). 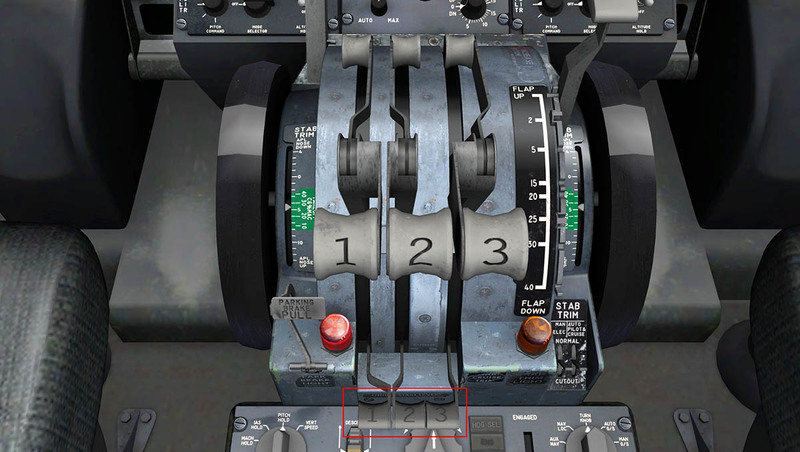 Clicking the switch down on number 3 engine (Start sequence is 3, 2 (center) and 1) and the dial will start to move in the n2 gauge, when it reaches 17-20% you introduce the fuel by flipping up the "flow/cutoff valve" up. From here on the engine will power up to full idle and you can now start the other engines in sequence. 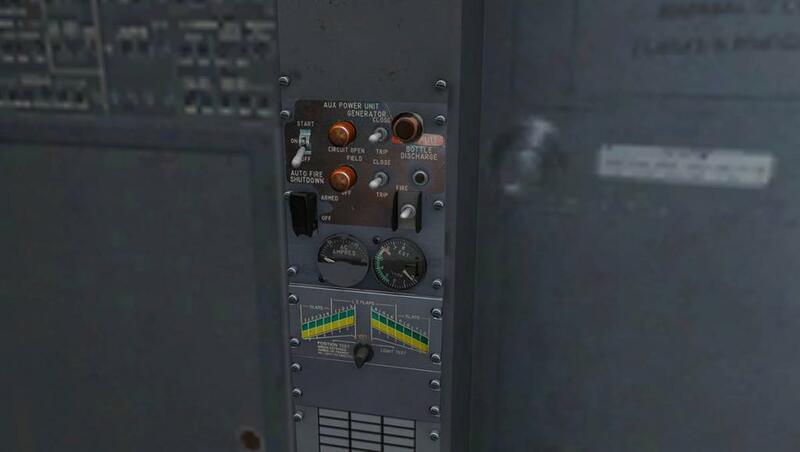 When done you can switch the electrical power to the engines and close down the APU (before flight). In now not requiring the "Bleed" function, then set your Air-Con A/C packs to provide bleed to the aircraft's pressure and cooling systems. Easy to do? yes after a few run through. It is slightly complicated but with a few practices it comes to you pretty easily. Knowing what dial or switch does what easily helps you find your way around. 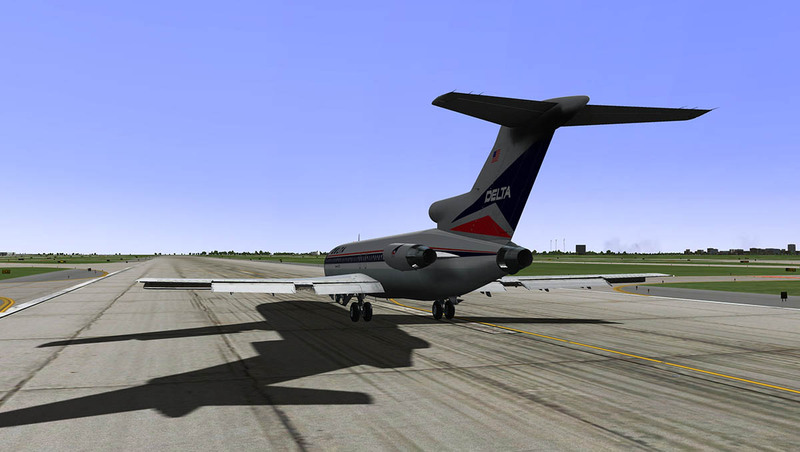 The sound of a Boeing 727 in idle is that loud whining squealing noise that was so familiar only a few years ago. The FlyJSim sounds are extremely good... Noisy, but good. And they get better. Flying the an aircraft of this era will mean many items you take for granted are not available to you. Flying today still means you have to prepare for a flight and a route basically still the same way. But you didn't have GPS points however in the 60's or mapping tools to plot your course to almost within a few feet of your route. Routing back then was mostly VOR to VOR (Nav-Aid) Navigation. So any route was mostly created around these Nav-Aids. NDB was also used but they don't have the distance (To or From) so they were a secondary aid. Still more importantly was that you had to have your course (Route) defined by headings, which was really the heading from one VOR to the next VOR (or NDB if used). So a preparation of a route is required that has this basic information. 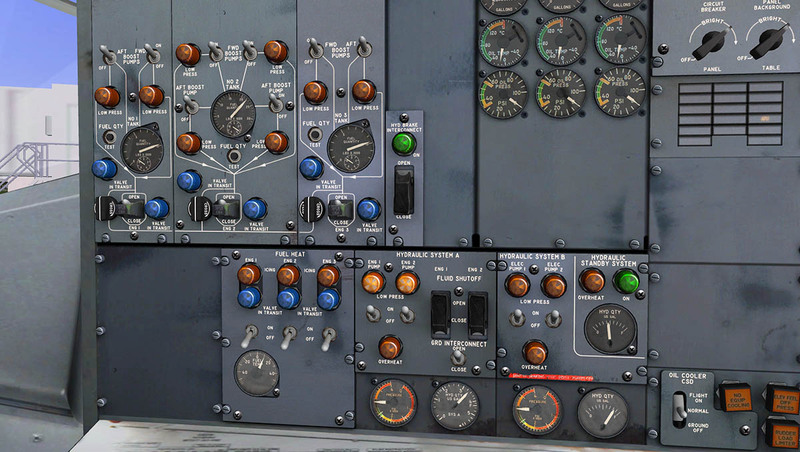 You can't use a standard FMS plan in the Boeing 727 or the later FMC routing systems. 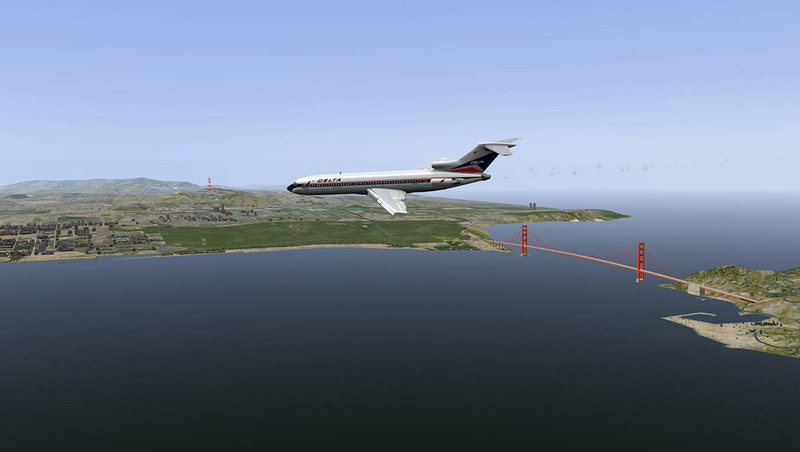 There is however as an optional extra (US$10) for the FlyJSim 727 an early inertial navigation system (INS) called CIVA for"Delco Carousel IV-A Inertial Navigation System". 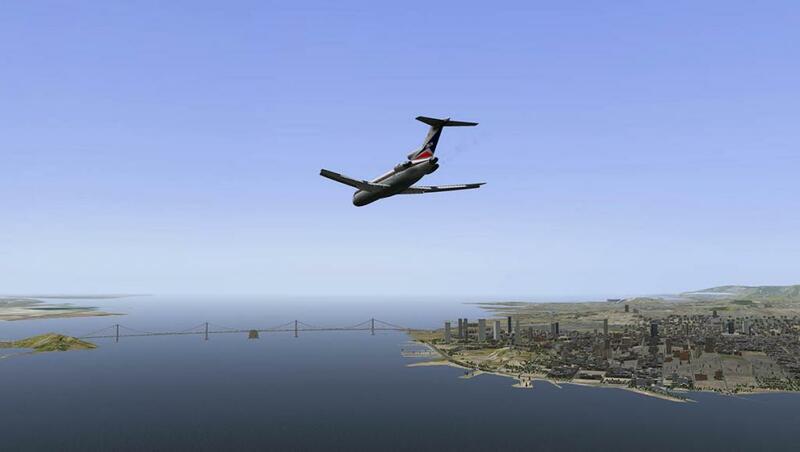 It can use a standard X-Plane FMS plan, but it is quirky to set up and use. Worse it has only 9 useable waypoint settings. Here I need far more waypoints than the CIVA can provide, and so I am doing the route VOR to VOR. The route created and printed out will give you the frequencies of each VOR you require and more importantly plus their headings. I have set the first VOR UKW (freq 112.40) on the heading using the course (305º) needle (the FL NDB (219) is also set as my turn point to the VOR). On the radio panel the first (UKW - Freq112.70) and second VOR (SPS - Freq112.70) frequencies are set ready. It is extremely important you have this information collected and ready before a flight including the right charts and that the settings are correctly set on the radio panel. Here the VOR needle is pointing correctly to the UKW Nav-Aid and the course is set to the same direction. 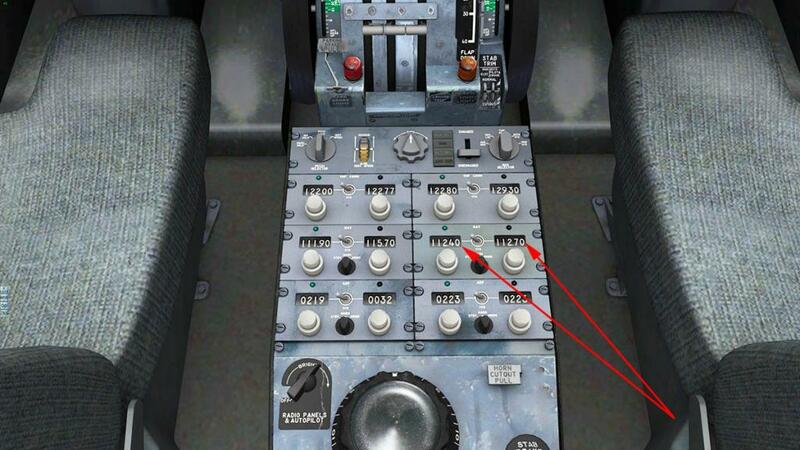 You have a "pushback" included in the (O) Options menu. It is very basic and no visible tug. 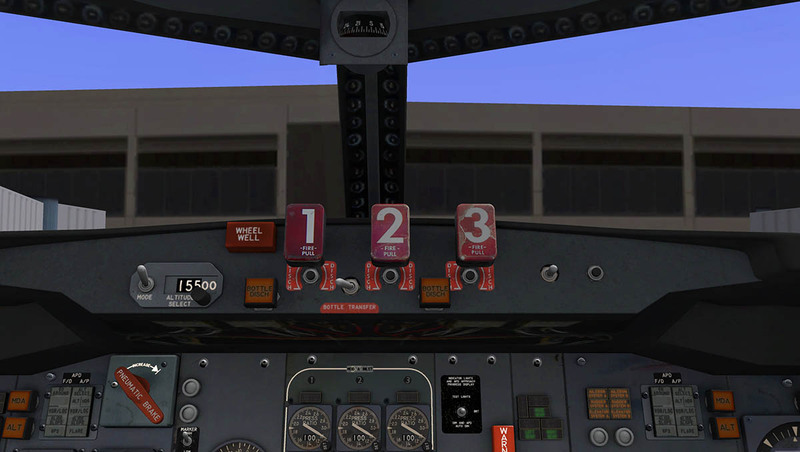 select and then it pushes back, turn via the rudders and brake to stop. 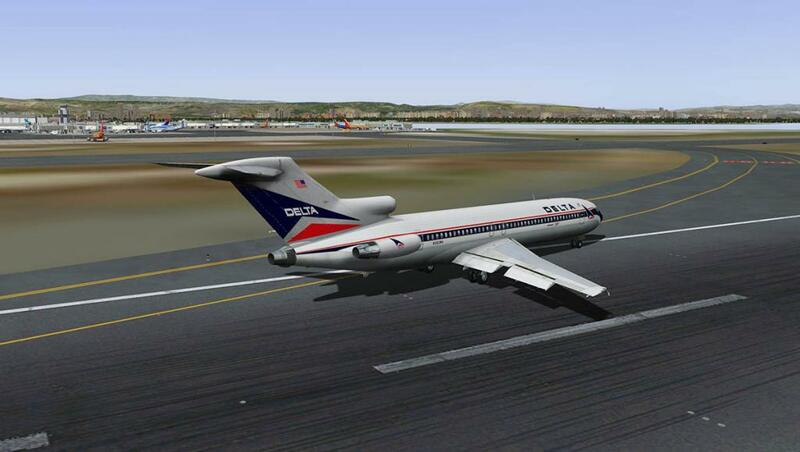 (You can use reverse thrust, the real 727's actually did. But watch those brakes as you can lift the nose off the floor if you stop to quickly. 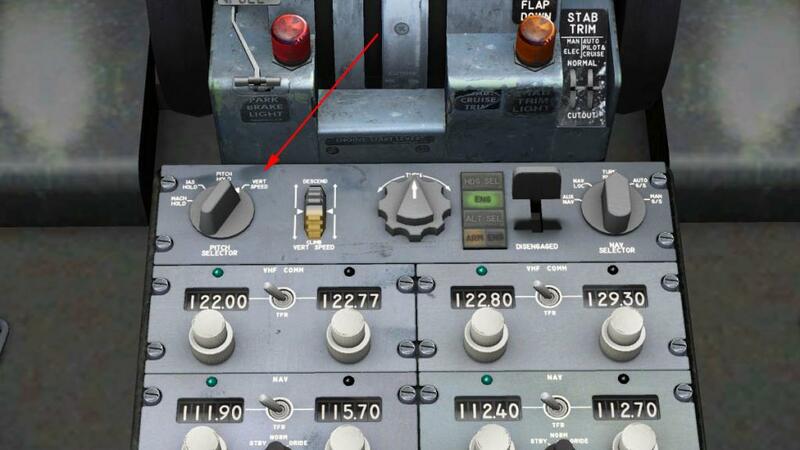 Take-off flap setting is a very long 20º (or 4 clicks). FlyJSim's flap animation and detailing is the best I have ever seen in X-Plane, So complicated and so beautifully assembled. The Boeing 727 flap system is very complicated to allow the aircraft to land at very low speeds (130knts!). There are leading-edge devices (Krueger, or hinged, flaps on the inner wing and extendable leading edge slats out to the wingtip) and trailing-edge lift enhancement equipment (triple-slotted, aft-moving flaps). They also create a lot of drag. 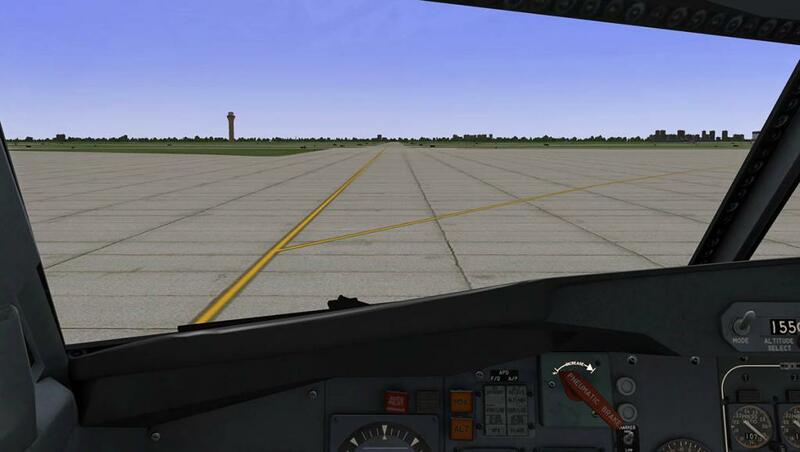 Cleared from the runway hold position I turn the aircraft on to 35L.... and straight into the full power up of all throttles to around 97% on the N1. The noise is deafening, but brilliant perfect sounds. 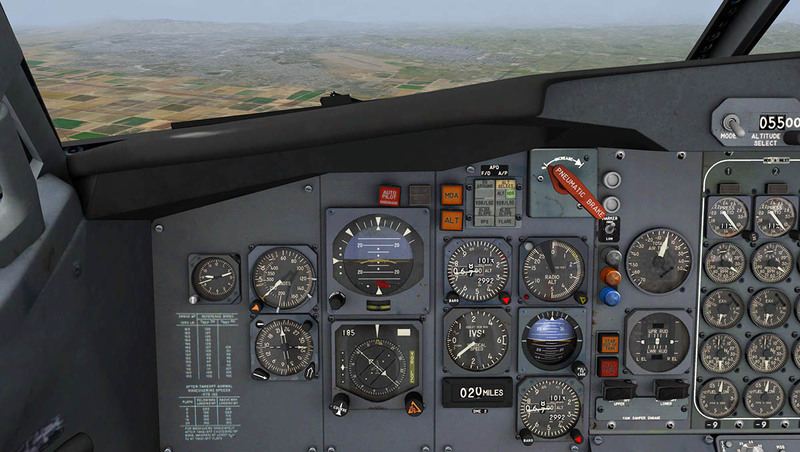 The aircraft gathers speed but very slowly at first, and at 145kts (v2 +10 is recommended) I pull the stick back. 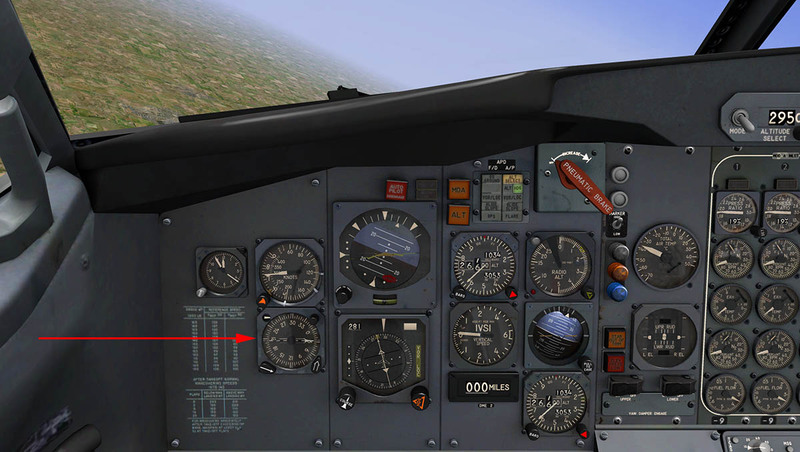 You are not going to go into a very steep climb at first and only to... 5º-8º until the aircraft has some air under the wheels before gaining pitch to a more 15º or 2000fpm. You have a rear skid under the rear in case you mess it up, but that would be a sign of a poor pilot if you scratched it?... 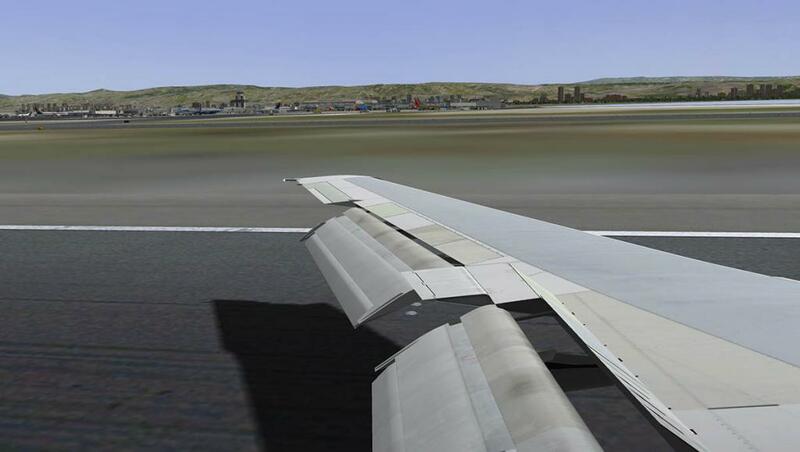 Flaps in quickly to 5º to reduce the drag and as you approach 250knts then they are fully retracted. 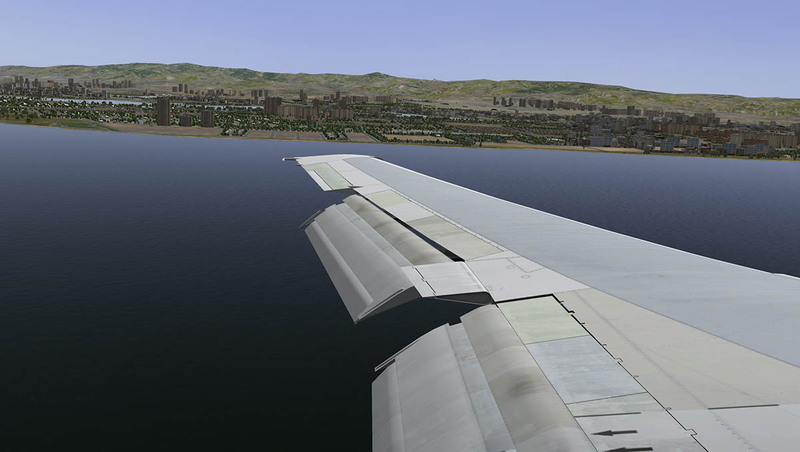 The aircraft handles very smoothly under the climb and you can hold the pitch perfectly. At the right point now switch on the Autopilot and the AP will hold your pitch for you. You have to maintain your vigilance on your "Press (pressure) Ratio". Go above the marker at 19 and nasty things can start to happen. 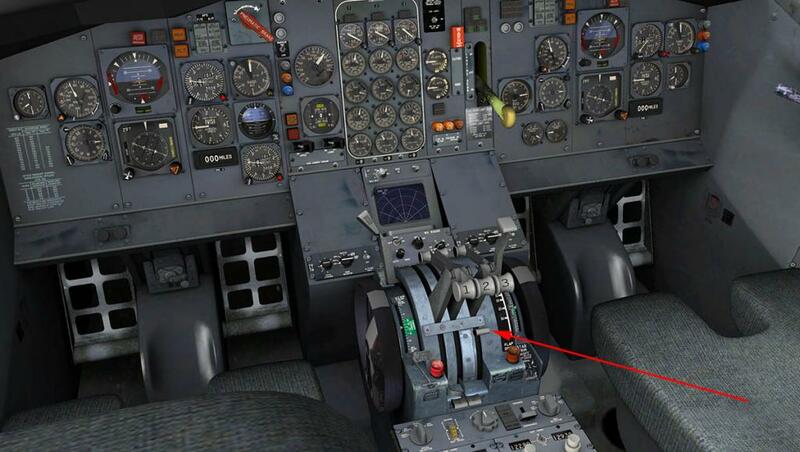 The B727 does not have any engine management systems, so you (the pilots) are responsible in keeping the engines within their operating limits. 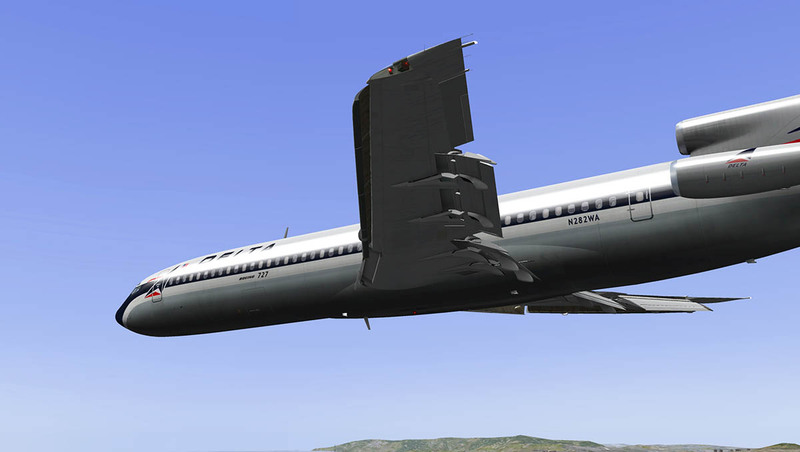 push those JT8D engines too far and they will burn out... and quickly. So even in the climb you are finding the best compromise between the PR at 19 (or below), keeping 250knts and having the best pitch of around 2000fpm. You don't let that speed fall, not even by a small amount because that stall comes very quickly with a very quick loss of the speed. The B727 will climb very nicely if you get the balance right, keep to 250knts under 10,000ft and 300knts/Mo.78 above 10,000ft. Watch the speed in the other setting as well when you level off as the knots can then climb the other way very quickly, expertly adjusting the throttle can keep you in the right speed range. 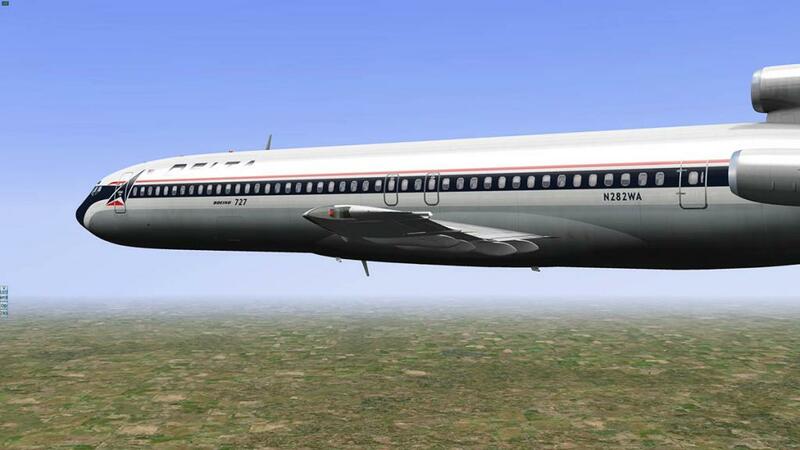 You don't want to lose the 727 in any situation, it is very hard to recover (It can be done...) the spins are lethal, but most of the time you will be going in to the ground. It is important to know the limits of the aircraft. 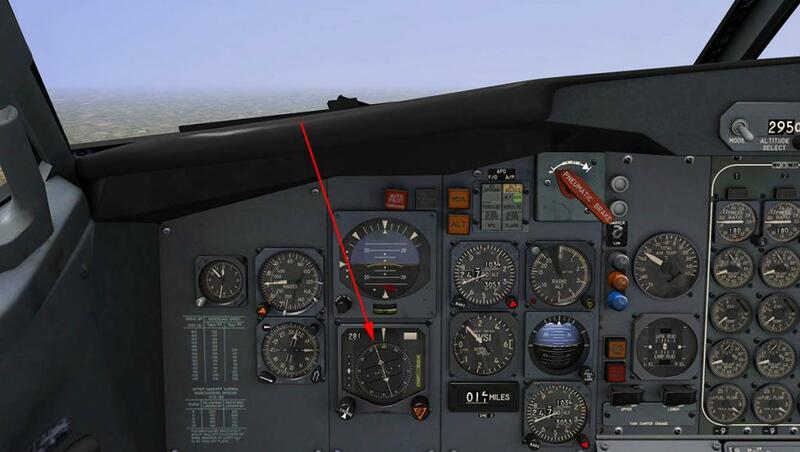 Select HDG SEL on the AP to turn to the heading bug set on the course needle (305º) and the 727 bird will turn to the heading. Then select "ALT SEL" (altitude select) on the AP to confirm to level off in this case the selected height of 15,000ft. The selection is on the top of the centre of the panel in large numbers (the switch will select 1000ft or 500ft increments). It is shown on the pilot's and Co-Pilot's panels that the "HDG" and "ALT Select" are active. Now comes the tricky part? The aircraft is still holding the set pitch, and you want more control over the climb angle. 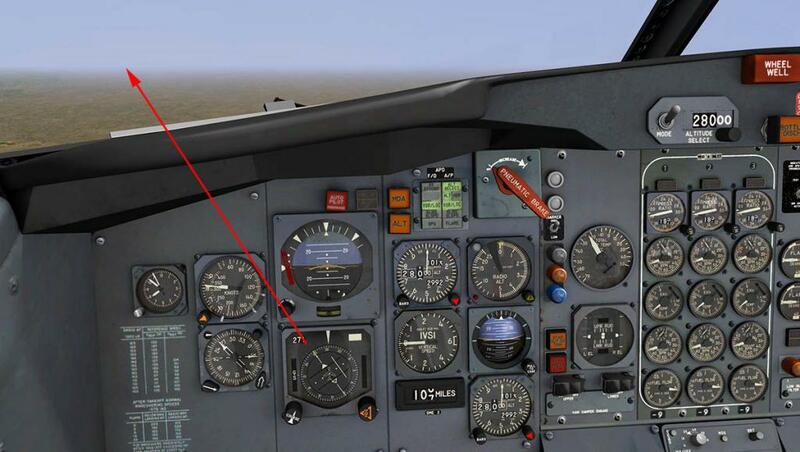 To do this on the AP you switch to "VERT SPEED" (V/S) and adjust the pitch via the Climb or Descend selector. But the transition from the held pitch to the V/S is a bit of a guessing game. So you have to find the right angle you want very quickly in not to lose your current climb or any height. Practice can make the pitch switch over go smoothly, but it is a bit of an art to get it just right. 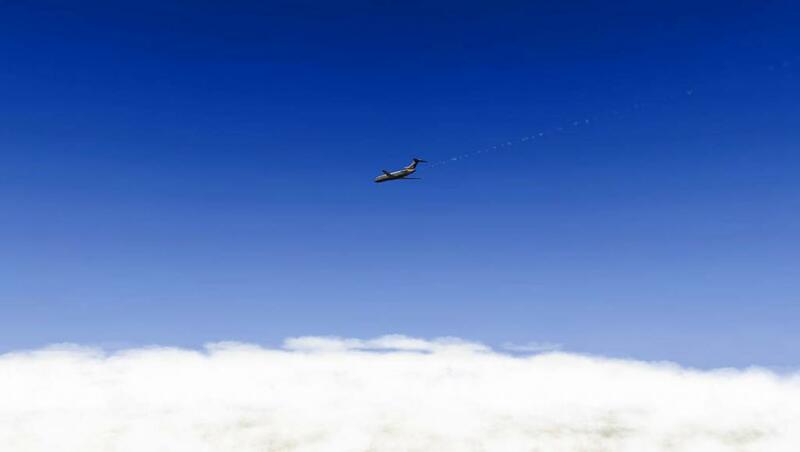 Reset the altitude to 29,500ft and the speed around 300knts is going to keep the climb clean. 1000fpm pitch and reduce to 400-500ft per minute as required (I usually do this in the last 3000ft). There is the option on the AP to use the VOR Lock (NAV LOC), selecting this option should lock you on to the set Nav-Aid. It is yellow when searching and turns green when locked (you need to be on the right heading anyway). But it does work? 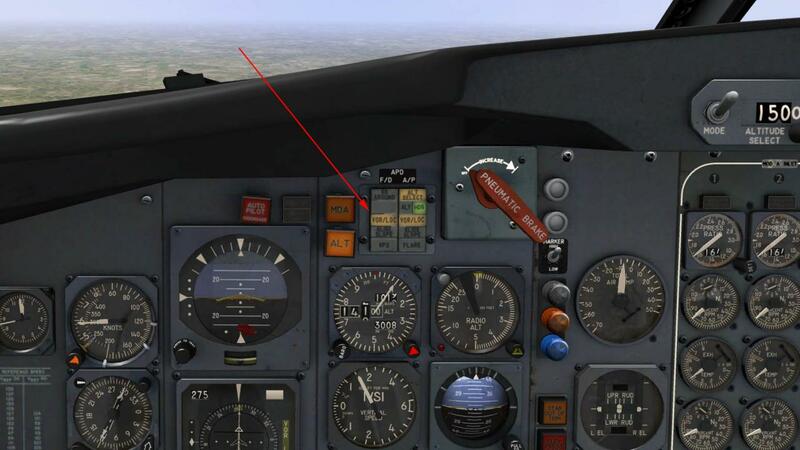 At lock the aircraft turns away from the selected VOR heading noted by the the direction of the red arrow. Which is really annoying as you need this feature of the AP in the way you navigate. For reliability just stay on the heading setting (default) from VOR to VOR. So even though the Autopilot is very basic, it is very good and covers most of the functions you require. 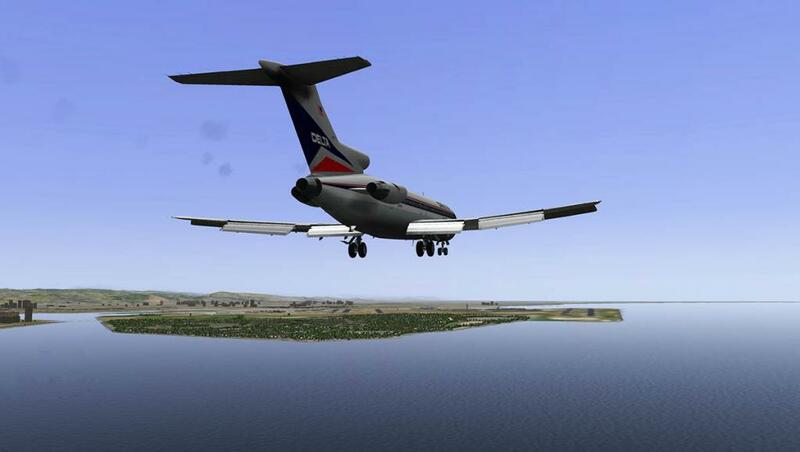 Our route now covers the waypoints - TXO - ABQ - GUP - PGS - BTY - BIH to SAC (Sacramento). This is an amazing aircraft to fly across a distance. And there is plenty to do in navigating and monitoring the systems (both now are mostly automatic functions on modern aircraft). 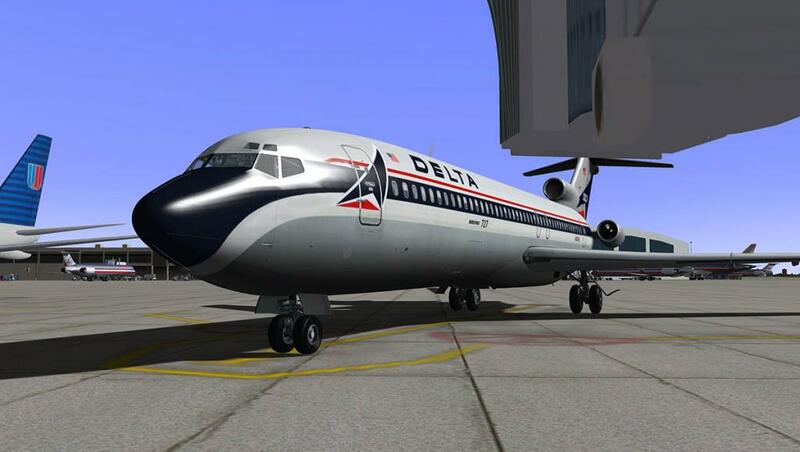 Remember you are doing the work of three people in the B727. 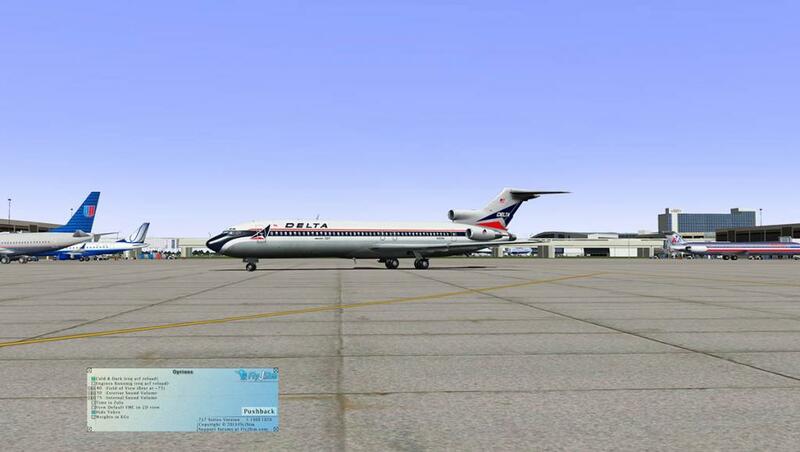 The only item that came at me was the alert of "You have ice on the wing by being below -20" It snapped the B727 into a deadly spin. Next time flying I switched on the Anti-Ice wing heaters (OHP) and the problem never came back... 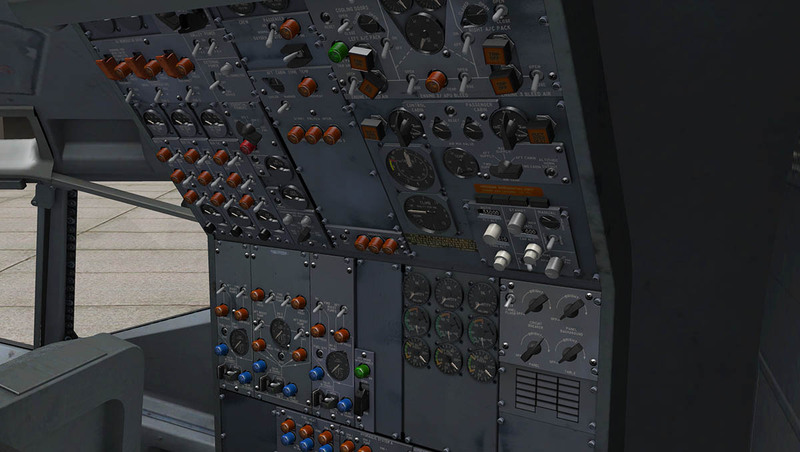 But FlyJSim says its not implemented into the systems. But it worked for me every time? Just past VOR - BIH (Bishop). I started the descent down to 10,000ft at SAC (Sacramento). 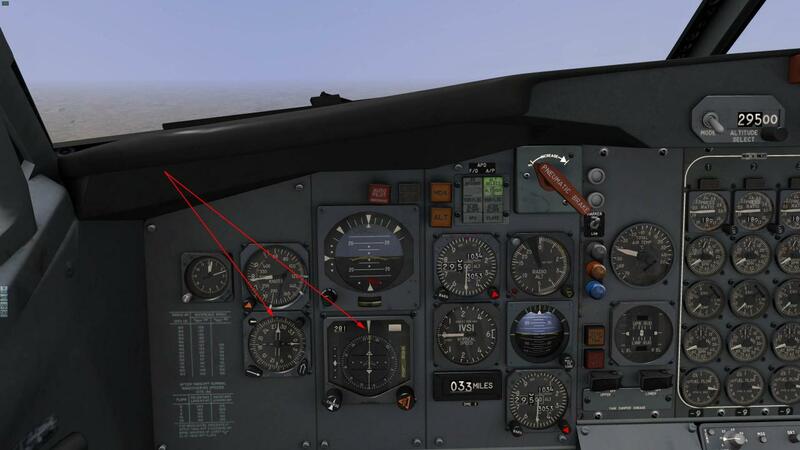 You usually put the throttles to idle at a 2000fpm descent. 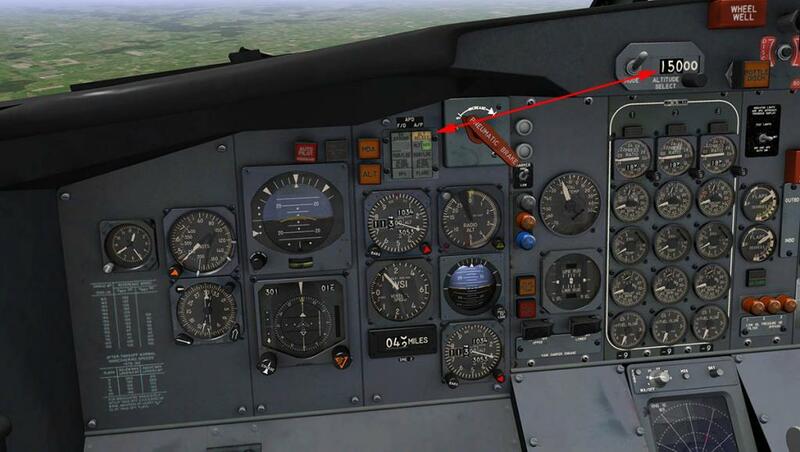 However sometimes in the B727 you may need to use the airbrakes to control the speed back down to 250knts at the 10,000ft arrival altitude. 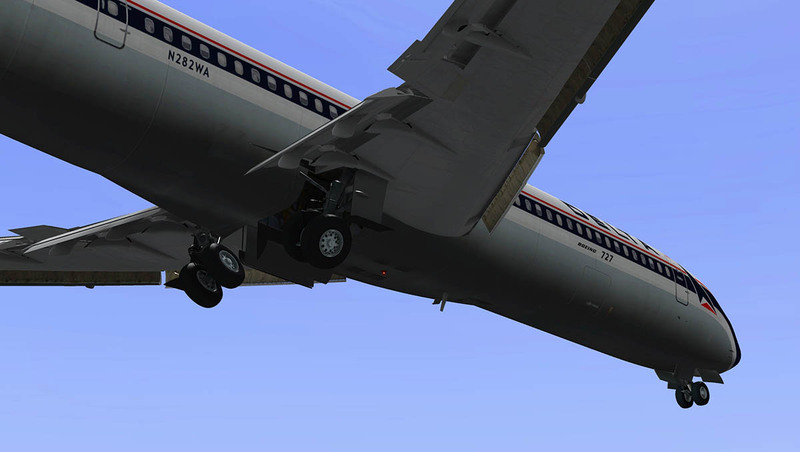 A look along the wing with the airbrakes (spoilers) set shows the complexity of the FlyJSim B727 wings... It is also incredibly realistic with excellent wing flex. At SAC I set up the Oakland Runway 11 frequency (NAV1) of 111.90 and inserted RWY29 at 108.70 just in case I had to land from the south. heading to SGD at 234º and then I set up the SAU turn at 186º, In reality I will turn just slightly before SAU to line up directly for OAK's RWY11. Height is reduced from 10,000ft to 5500ft to a ILS collect at 1800ft. I usually get well below the ILS to control the speed down the beam. 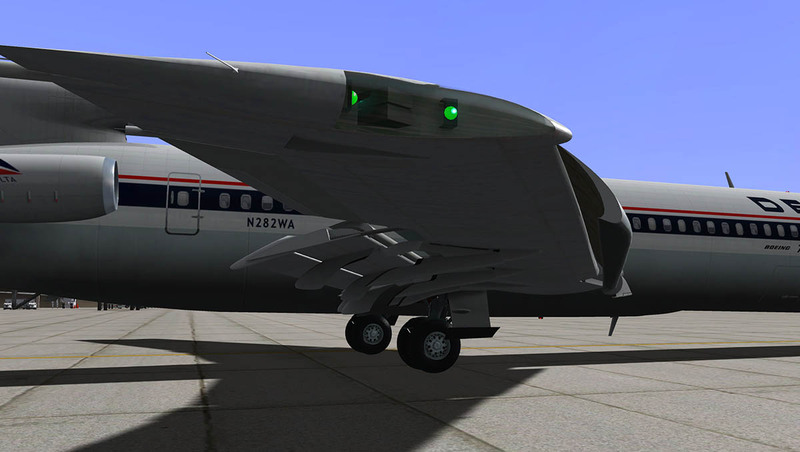 Using the flaps on the 727 is a devil you do or the devil you don't. The settings are 0º, 2º, 5º, 15º, 20º, 25º, 30º and 40º, but the 40º is rarely used. This lowest setting is very close to the stall speed noted as 106knts (which is very low anyway). The high T-Tail configuration would literally let the aircraft fall out of the air. There was a debate about this and 30º flap was made the maximum lowest setting to be used by most operators. The wing is effective down to 15º, but below that you get very heavy drag. Drop the undercarriage and the drag gets far worse. 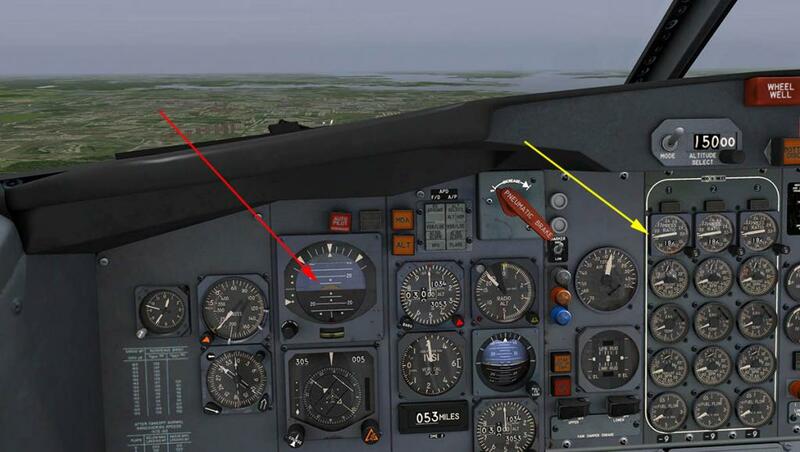 So as you set up your speed and lower the flaps past 15º you need a lot of engine power to counteract the drag, by 30º flap your thrust is quite high to keep the aircraft in the air. 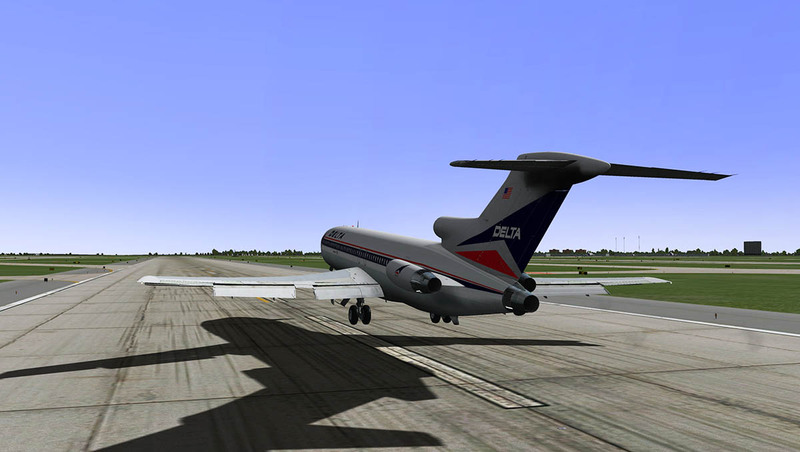 In saying that the B727 is very stable at these low speeds and excellent in a hands on landing. The landing lighting is excellent with two sets of lights on each wing, you can select all four lights or outbound or inbound lighting. Wing and runway turnoff lights are also available. 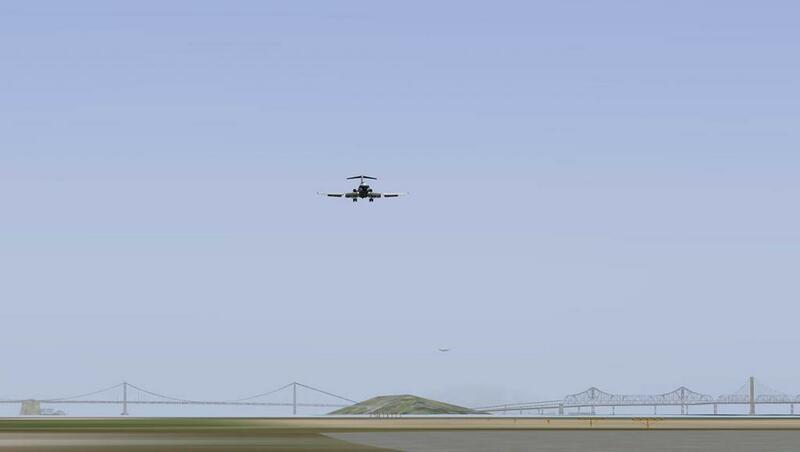 The Menu "V card" is showing me a vRef of 132knts and so I will aim for a landing around that. Auto brakes are set to "MIN", and the ILS is selected by "AUTO G/S" on the AP. And lock on is very good. 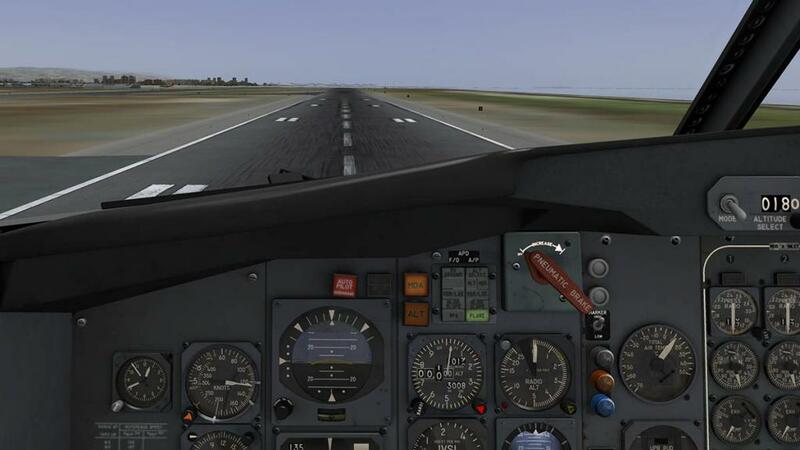 A manual landing is also very good with more throttle control to adjust the height and speed. As noted landing speed is very low at around just under 140knts (135knts at touch). 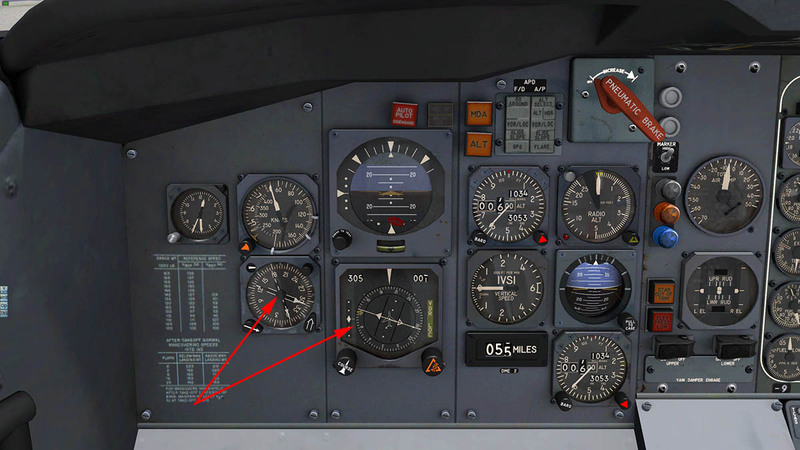 Light control of the throttles is needed to contain the correct speeds. The aircraft is great on the flare but slightly nose up to control the drift down to the runway. 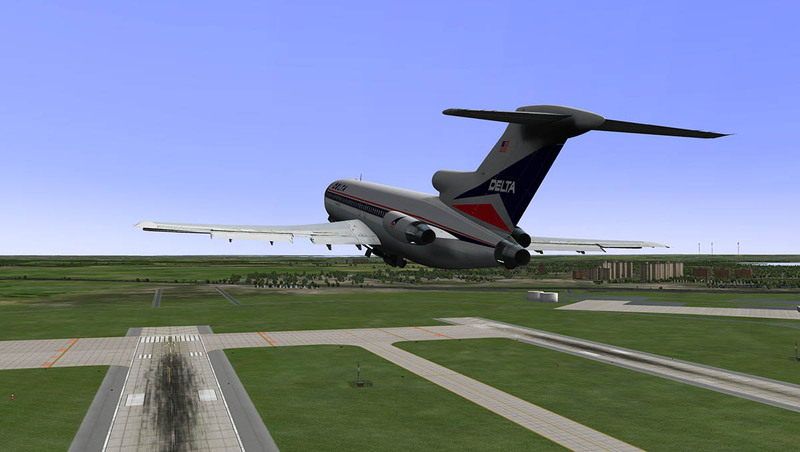 I have never made a bad landing in the B727 and that shows the control you have in the flare. Once you have contacted the runway then up the spoilers. These are manual so you have to work them up (and down) yourself with no auto deploy. 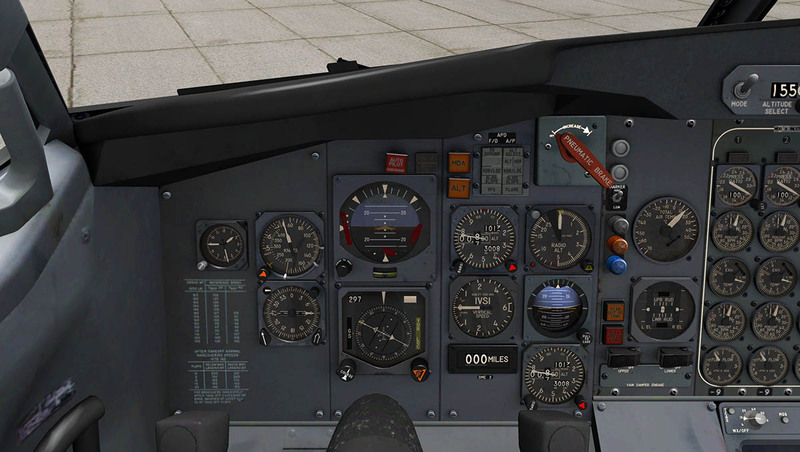 Flip the throttle thrust-reverser handles and feel the power (and noise) of the engines reverse-thrust (Clam-shells close in the engines) and let the speed drop to a crawl. The Auto-brakes can grab the main wheels, so watch that and a flick of the brake should release them. 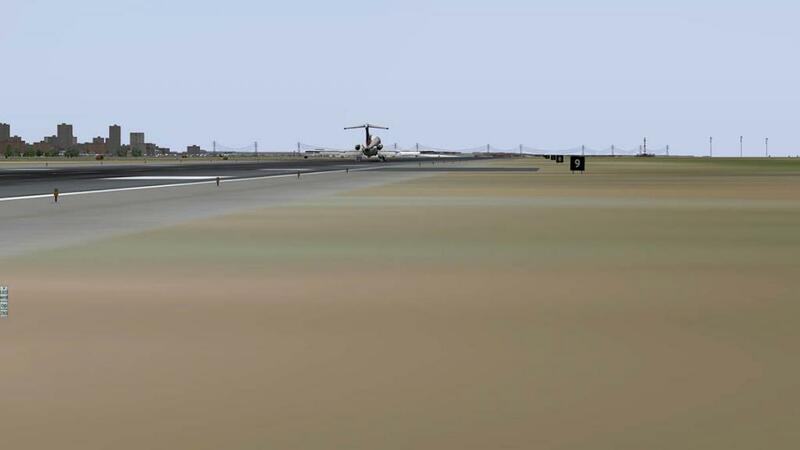 Once down to taxi speed then pull off the runway and clean the aircraft up. Heading for the gate the aircraft is lighter but still easy to manoeuvre in to a tight ramp area. When shutdown via the fuel flow/cutoff valves, I checked the Weights & Balances of the empty aircraft to note my final settings. 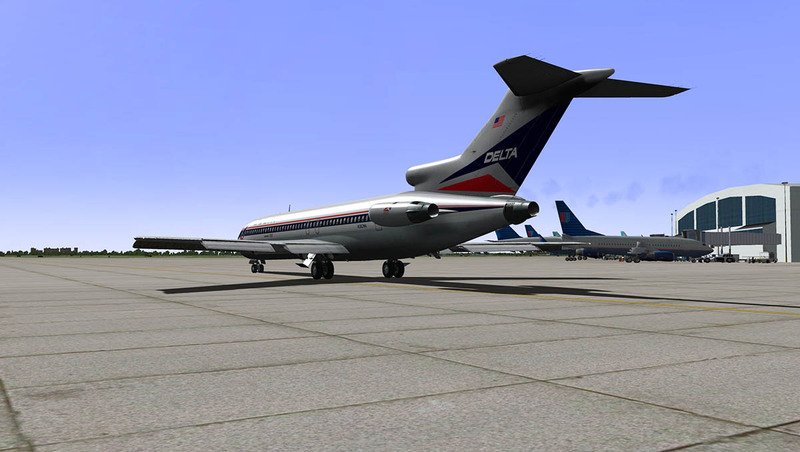 Flying the FlyJSIm Boeing 727 is an experience. 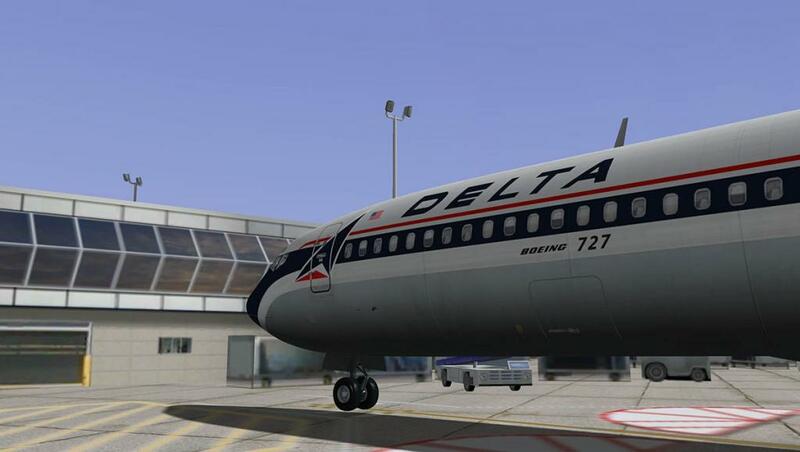 It sends you back to another era of flight and you are immersed in the the way flying was done back then. 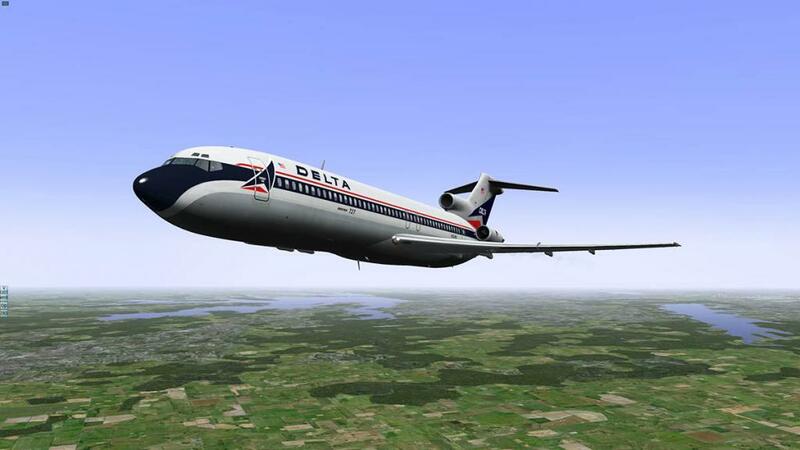 The Boeing 727 is a very interesting aircraft to fly for many reasons. The main one is how much you had to do back then that is totally automated now. And that is the the deeper experience that comes out of the aircraft. 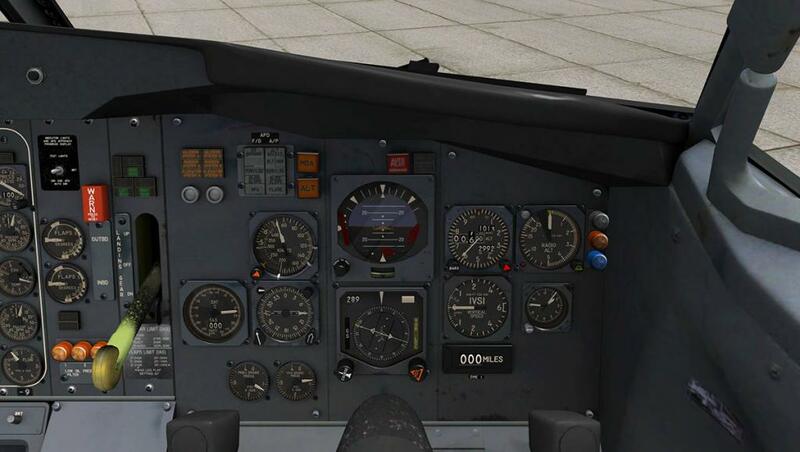 preparation is the key in learning the aircraft in detail, right down to the little stuff of how the fuel, electrical, Air-Con,hydraulics the lot and how it all works and the limitations of the engines and systems. 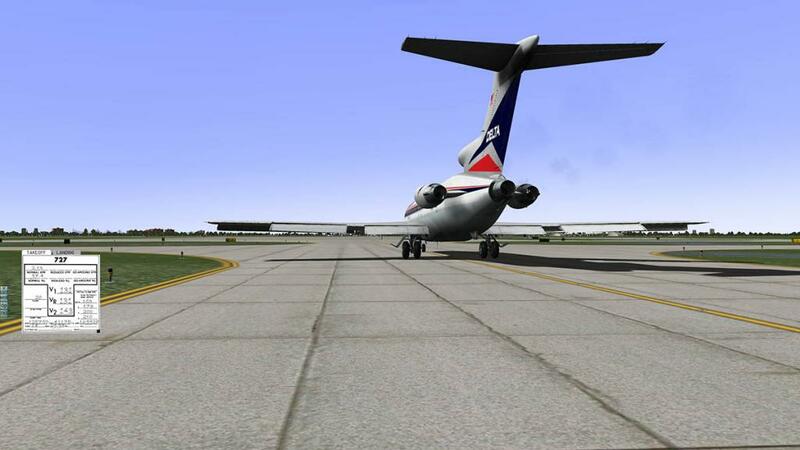 Also your routing has to first rate to get the flight perfect and get the aircraft from point to point. 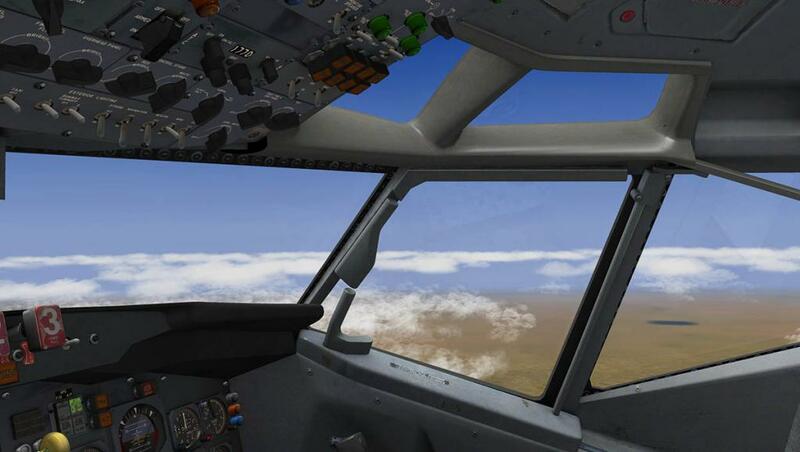 Through the flight you are constantly adjusting the speed and checking systems while navigating the aircraft across a fair distance. It is hard work. But get it right and do a perfect Gate to Gate service and you will be happiest person for days. 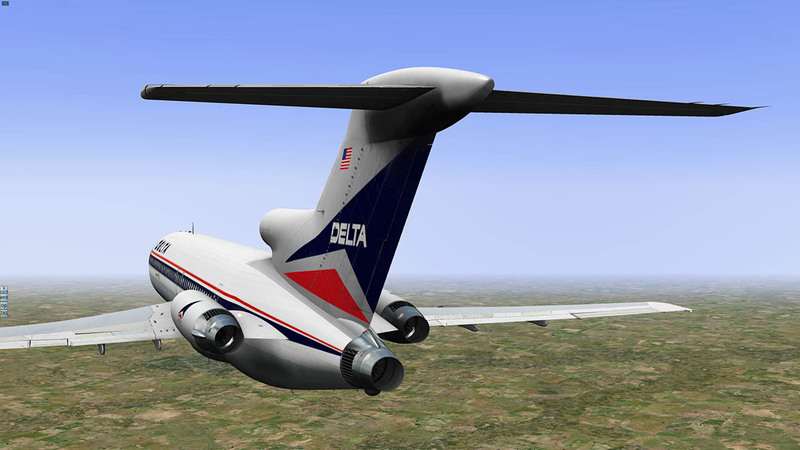 So it is challenging the B727 but highly rewarding. It is a brilliant aircraft to fly, and fly you do. 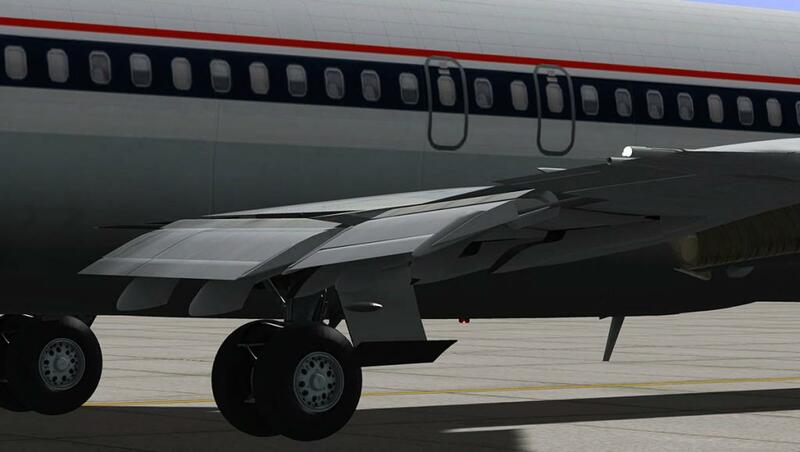 One of the best aircraft available in X-Plane.... without doubt. 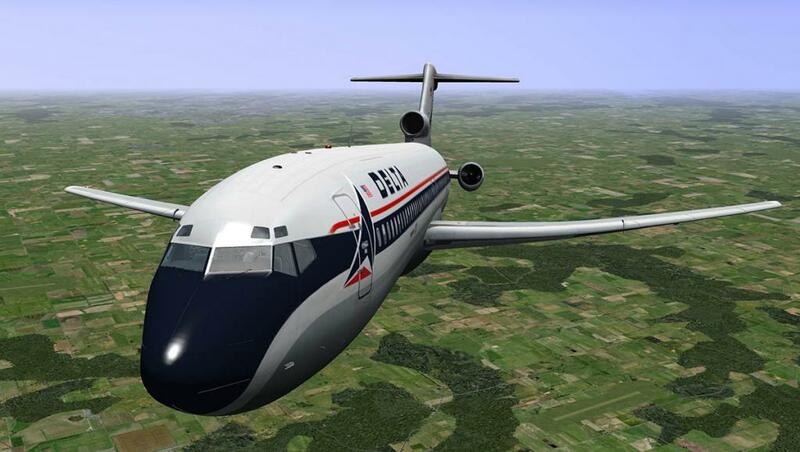 Your readers may be interested in this checklist to bring the Boeing 727 alive. 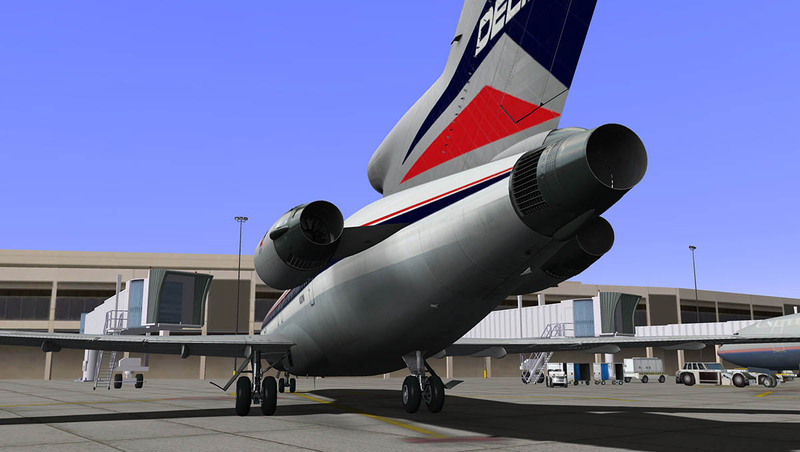 It closely follows procedures published with the aircraft and should help get the best out of the B727. thanks. really good review. 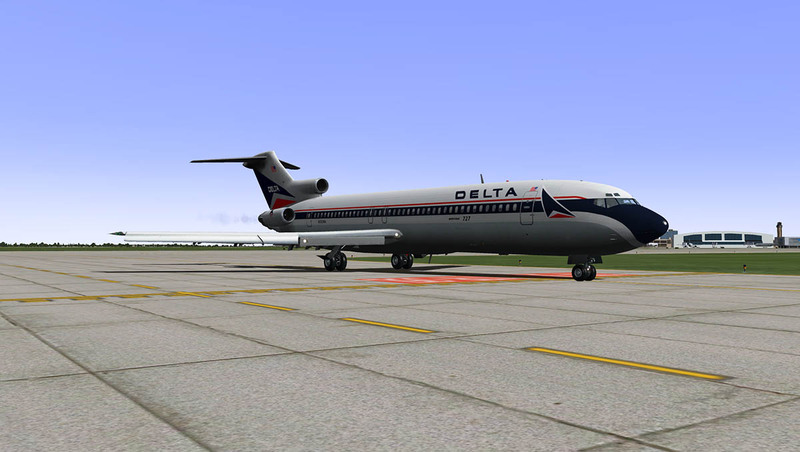 I am also enjoying the 727 after everybody advised me to get it. I made the jump from C172 ga Style aircraft (where i hold a PPL for those) to a bigger plane (Q400 and ATR72) to the 727 and now the A320. It is less complex than the A320 but somehow more fun to fly. 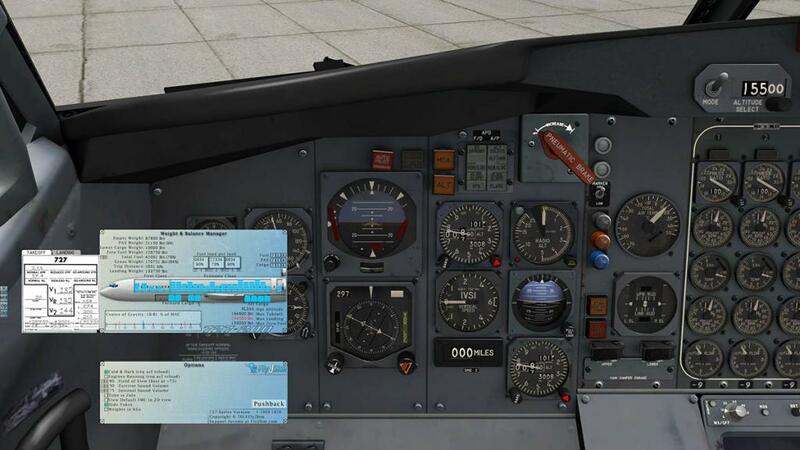 You can use the X-plane FMC to load a flight plan and cheat or just fly it VOR to VOR. Both a things are great. 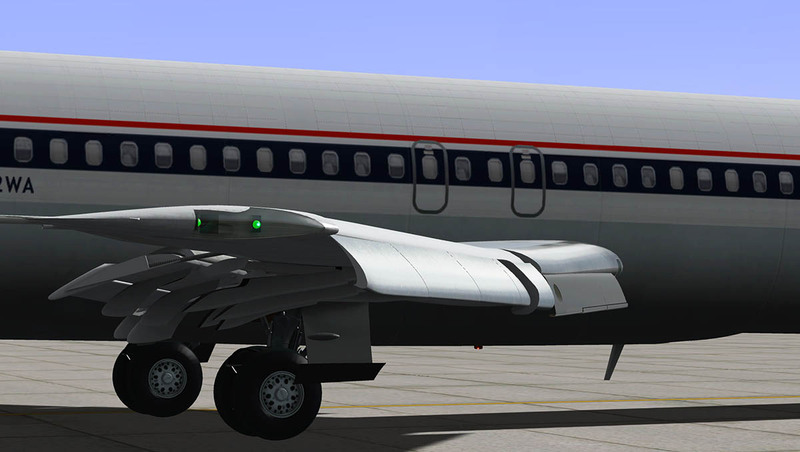 I also love you can adjust the weight of the aircraft and actually see the landing gear getting pushed lower and lower. Really detailed animated aircraft all around. 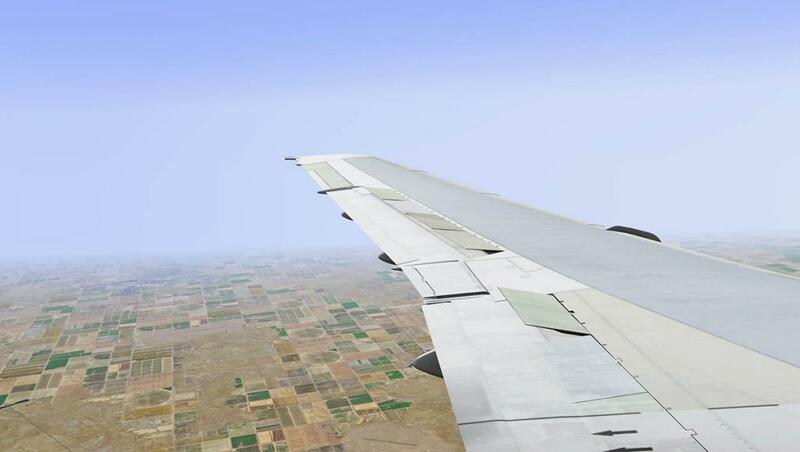 A must for X-plane in my eyes. 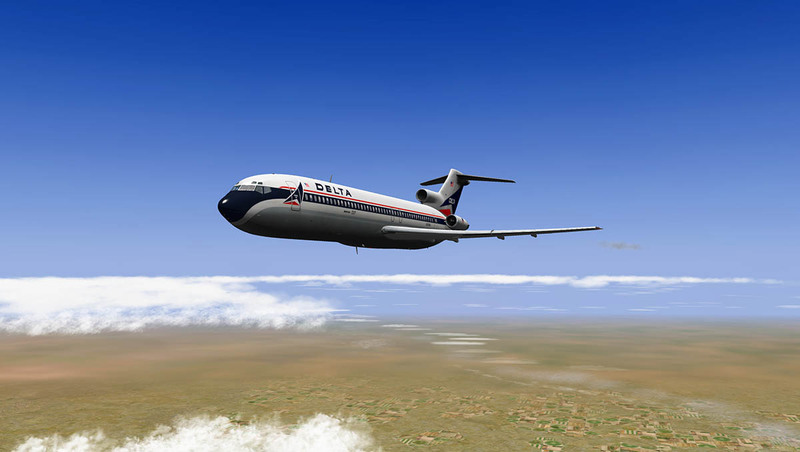 There is however as an optional extra (US$10) for the FlyJSim 727 an early inertial navigation system (INS) called CIVA for"Delco Carousel IV-A Inertial Navigation System". 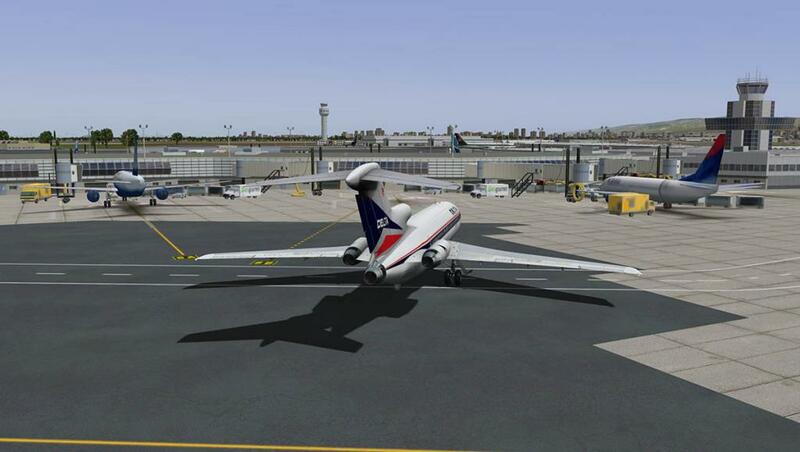 It can use a standard X-Plane FMS plan, but it is quirky to set up and use. Worse it has only 9 useable waypoint settings. Here I need far more waypoints than the CIVA can provide, and so I am doing the route VOR to VOR. This could sound like that the CIVA could not be used for routes with more than 9 waypoints. It's not true - when you reach the 9th waypoint, the CIVA will navigate from the 9th to the 1st. The point is in changing the coords of the 1st waypoint to be actually the 10th meanwhile etc. When you fly from 8th to the 9th waypoint, you can even load the x-plane FMS plan - it loads its first 7 waypoints (not to break the 8->9 leg you are flying at that time), however the 8th and 9th must be entered manually. Just break your long flight plan into smaller chunks and it will work. 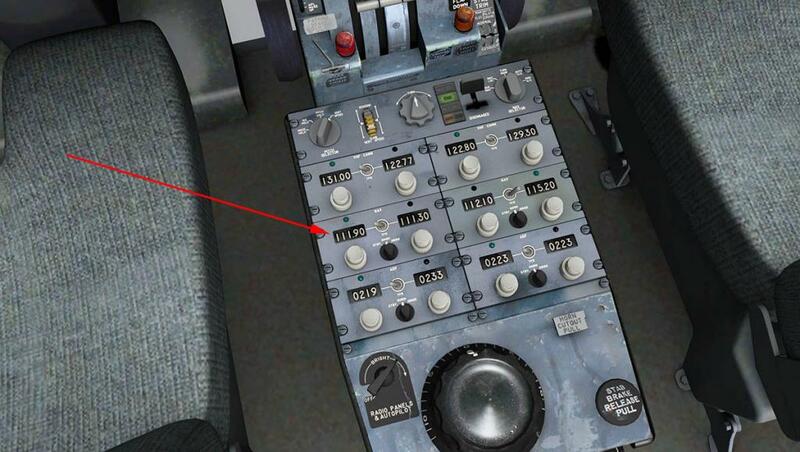 As Ye Olde Aircraft Mechanic I have to ask, does this Sim give you EPR settings depending on pressure alt and temp? Because that is how your power is set in those jets. The RPM and EGT were limit and condition gauges. Pulling up from my memory bank the EPR could run from 1.7 on a very cold high pressure altitude day(34.00 hg), up to 2.4 on a high hot runway. It's been about 15 years since I ran JT3D engines but the principal is the same. Also while I know the Military world best, I'm sure there was a "Price" for hitting the tail skid. In the Air Force I bet it would be worth a case for the ground crew ( I drink Henry's ) but I'm sure it would be worth at least 1st round at the hotel for the perpetrator for the crew including the cabin crew.